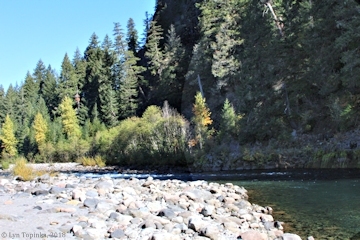 Click image to enlarge Lewis River looking towards mouth. 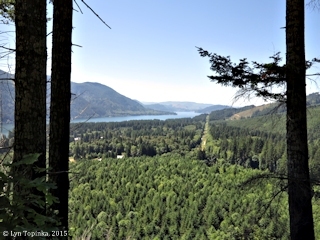 Looking towards Austin Point (on the right) and the Columbia River. Industry of St. Helens, Oregon, is in the background. Image taken March 29, 2007. The Lewis River is located on the Washington side of the Columbia River at River Mile (RM) 87.5. 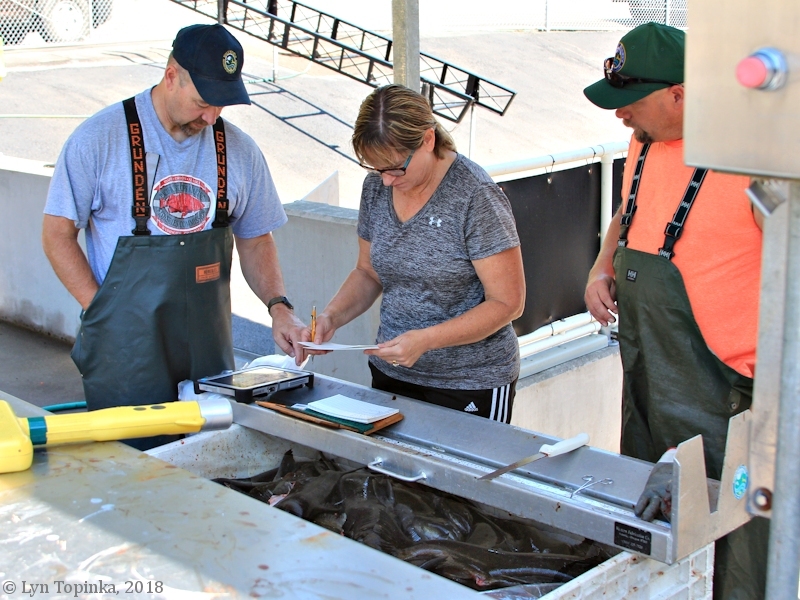 The watershed includes two large drainages, the North Fork Lewis and the East Fork Lewis, which converge approximately 3.5 miles upstream of the confluence with the Columbia. A half mile upstream is the Washington city of Woodland. Between Woodland and the Columbia lies the Lewis River Floodplain, also called "Woodland Bottoms". Along the Columbia River upstream from the Lewis River mouth is the downstream end of Bachelor Island and Lake River, and 33 miles upstream is Vancouver, Washington. Thirteen miles downstream of the Lewis River mouth is Kalama, Washington, and the Kalama River. 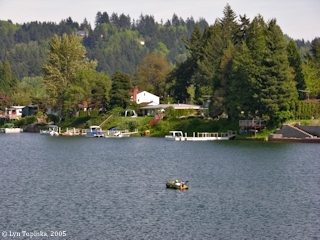 On the Oregon side of the Columbia River and slightly downstream of the mouth of the Lewis River is the Multnomah Channel and the Oregon community of St. Helens. The Warrior Rock Lighthouse can be seen from the mouth of the Lewis. The downstream bank at the mouth of the Lewis River is called "Austin Point". The island is Bachelor Island, which the Corp entered as "Green Bryor I." on their draft map. Moulton (1990, Vol.6) suggests the "narrow Chanel" could be the mouth of the Lewis River, however on both the draft map [Moulton, vol.1, map#89] and the route map [map#79] the downstream tip of Bachelor Island and the Lewis River are quite a distance apart, with today's Lake River/Bachelor Island Slough shown behind the island. 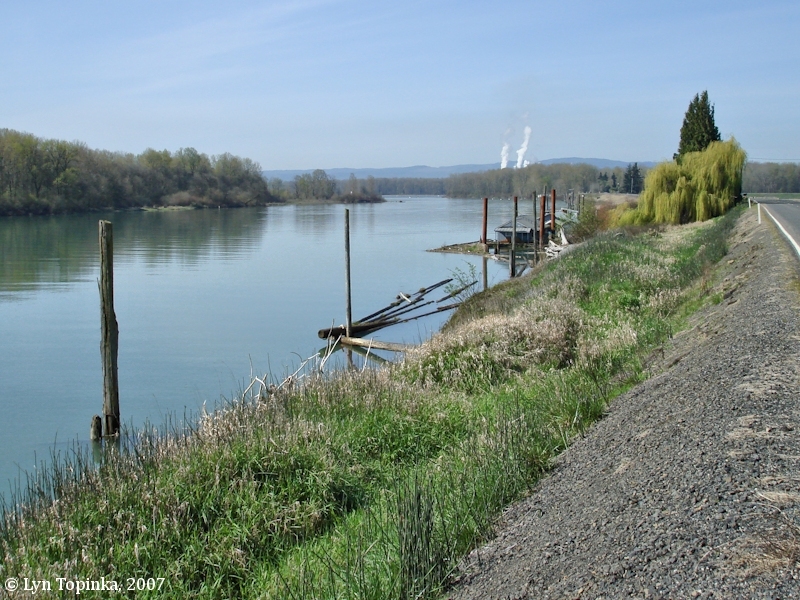 On the Corps return in March 1806, Lewis and Clark are informed of the Lewis River when they were camped on Deer Island. The next morning, on March 29, 1806, the men set off upstream. They pass a "large inlet" on the south (today's Multnomah Channel), and the Lewis River on the north. The "Quath lah pah tle" Village was located within today's Ridgefield National Wildlife Refuge. Lewis and Clark spent the night of March 29 near the village. 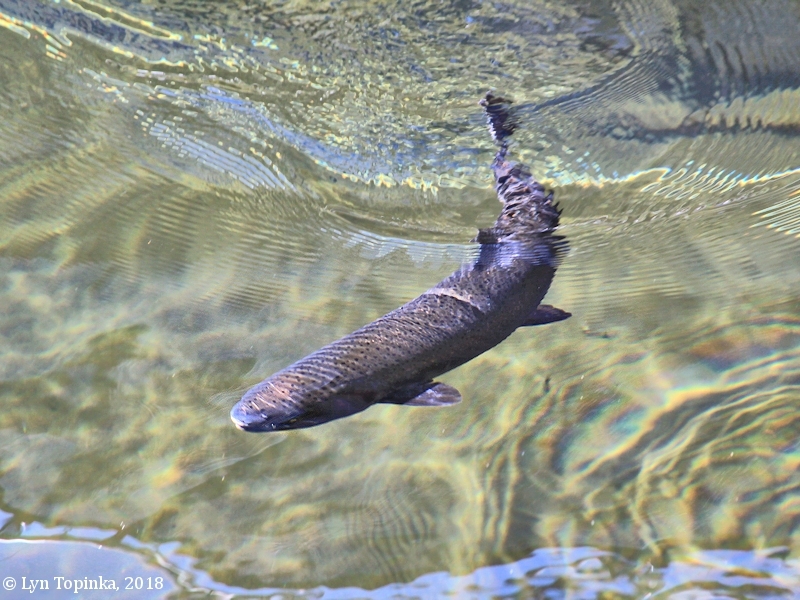 According to the Columbia Basin Fish and Wildlife Authority website (2004), the Lewis River watershed is approximately 93 miles long, has a total fall of approximately 12,000 feet, and drains an area of about 1,050 square miles. The headwaters arise on the southern flanks of Mount St. Helens and Mount Adams. Mount Adams is the highest peak in the basin at 12,307 feet, and Mount St. Helens is an active volcano. 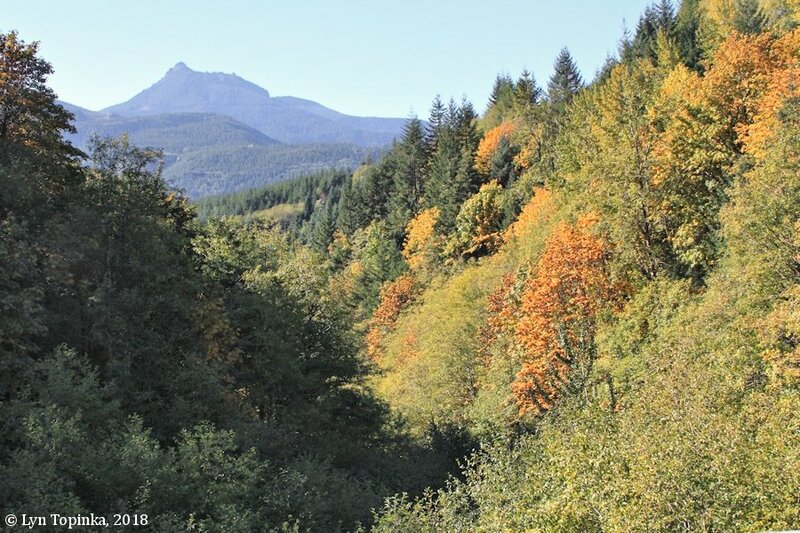 The majority of the Lewis River basin is forested, with an area of approximately 30 square miles of upper basin denuded by the eruption of Mount St. Helens in 1980. The major tributaries within the Lewis River system below Merwin Dam (RM 19.5) include the East Fork Lewis River, Johnson Creek, and Cedar Creek. The Lewis River drainage system is the result of geologic uplifting, volcanoes, and river flooding. The bedrock surrounding the three reservoirs is predominately younger Eocene to older Oligocene volcanic lava flows Oligocene volcaniclastic rocks, and Quaternary volcaniclastic deposits. The volcanic rocks have undergone regional compressional deformation with rock strata being folded by a major southeast plunging anticline and a southeast plunging syncline. Click image to enlarge Recreation, North Fork Lewis River. Image taken July 4, 2005. 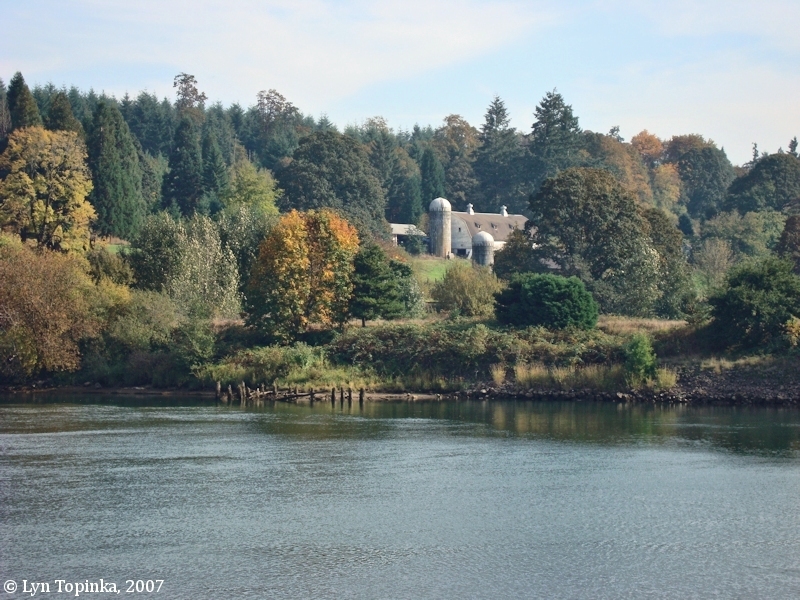 In 1792 Lieutenant Broughton of the Captain George Vancouver Expedition passed by the Lewis River on October 28, 1792, and named the Lewis River "Rushleigh's River". 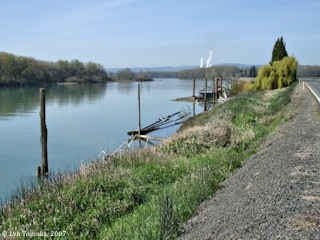 Warrior Point is the downstream tip of Sauvie Island and the "river" mentioned is the Columbia River. The three branches are "Call's River", today's Multnomah Channel, the Columbia, and "Rushleigh's River", today's Lewis River. Lewis and Clark passed the Lewis River on November 5, 1805, but did not make mention of it. On their return in March 1806 the Indians inform the men of the river which they call the Chah-wah-na-hi-ooks (see information presented above). 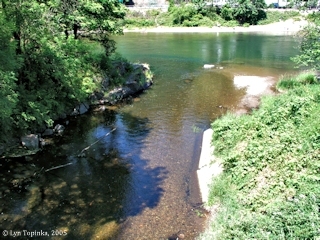 When the artist Paul Kane wrote about the Lewis River on March 26, 1847, he called the river the "Kattlepoutal River". 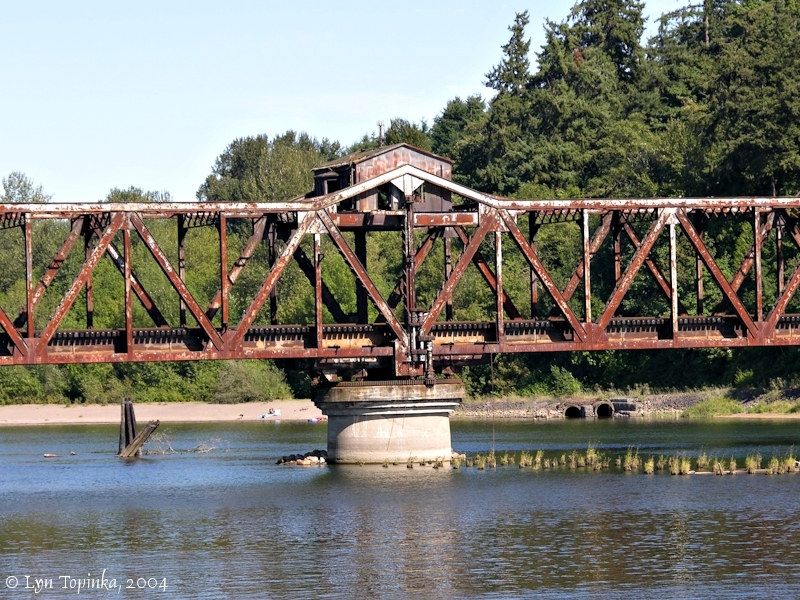 In 1853 the railroad mapped the North Fork Lewis River as "Cathlapootle River". 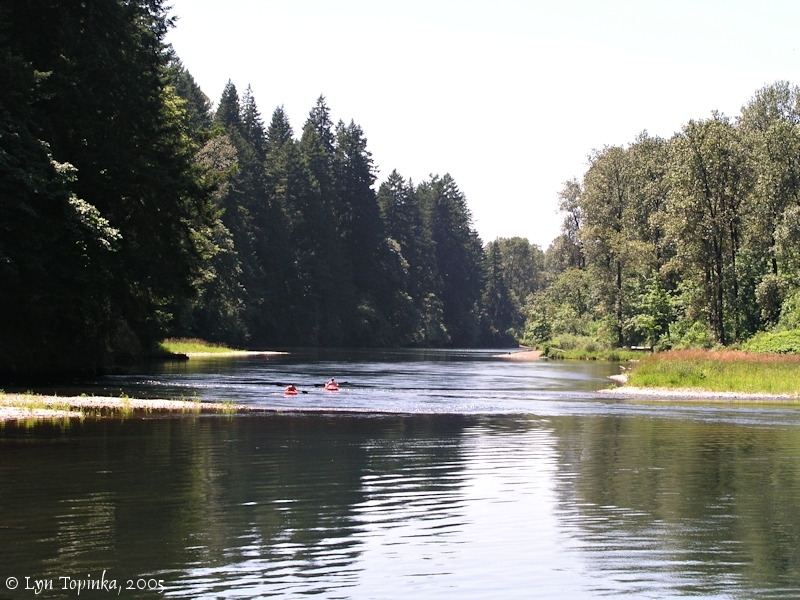 Another early name for the Lewis River was the "Washington River". An 1854 Washington Territory cadastral survey (tax survey) for T4N R1W has the Lewis River labelled the "Catapoodle R.". The State of Oregon cadastral survey for the same year has the Lewis as the "Cadapoodle River". Washington Territory's 1862 cadastral survey matches Oregon with the Lewis River being the "Cadapoodle River". An article in the "Pioneer and Democrat" newspaper (August 5, 1854, p.3) called the Lewis River the "Cathlapoodle River". The 1855 Railroad Survey Map conducted by Isaac Stevens shows the Lewis River as "Cath la pootle R." and today's East Fork Lewis River as "Yah kotl Riv.". 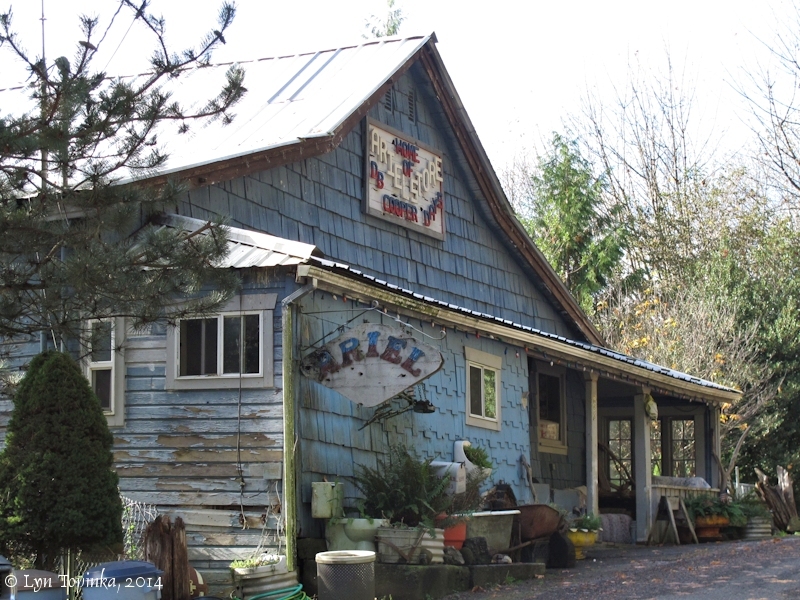 In 1866 Lincoln, one of the first settlements along the Lewis River, was founded. This small trading post and post office were located at the mouth of Lockwood Creek, named after Reuben Lockwood who settled the area. In 1881 Woodland was established on the Lewis River four miles upstream of its confluence with the Columbia. The 1881 U.S. Coast and Geodetic Survey's Chart No.5, "Kalama to Fales Landing", lists the Lewis as the "Lewis River". 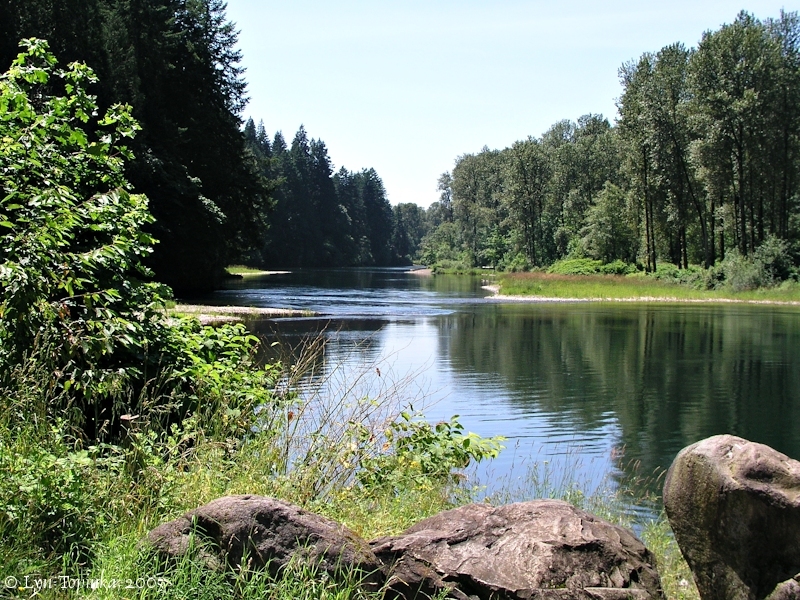 In 1929 the U.S. Board of Geographic Names made official the name "Lewis River". 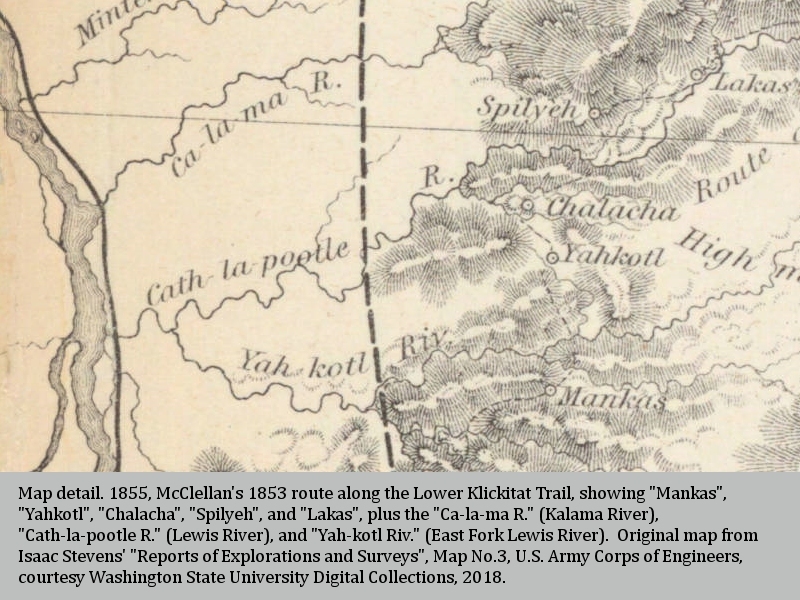 Click image to enlarge Map detail, 1855, McClellan's 1854 route along the Lower Klickitat Trail. Original map from Isaac Stevens' "Reports of Explorations and Surveys ...", 1855, Map No.3, U.S. Army Corps of Engineers, courtesy Washington State University Digital Colletions, 2018. "Mankas", "Yahkotl", "Chalacha", "Spilyeh", "Lakas", and the "Ca-la-ma R." (Kalama River), "Cath-la-pootle R." (Lewis River), and "Yah kotl Riv." (East Fork Lewis River). The Lewis River was NOT named after Captain Meriwhether Lewis of the 1805-1806 Lewis and Clark Expedition. The Lewis River was named after Adolphus Lee Lewis, or "Lewes", who, in 1845, took a donation land claim on the river's west bank. Adolphus Lee Lewis was the county surveyor in 1856, which may have had bearing on the naming of the Lewis River, Lewis River Valley, and Lewisville, a community located near a ford on the East Fork of the Lewis River, the location of today's Lewisville Park. The U.S. Bureau of Land Management's General Land Office Records (GLO) website (2011) shows a listing for the Heirs of Adolphus Lee Lewes, on December 22, 1865, being granted title to 322.42 acres of T5N R1E, section 30, and T5N R1W, sections 24 and 25, under the 1850 Oregon-Donation Act. The U.S. Bureau of Land Management's General Land Office Records (GLO) website (2011) shows a listing for Adolphus Lee Lewes, on February 8, 1892, being granted title to 35.75 acres of T5N R1E, section 18, under the 1820 Sale-Cash Entry. The GLO website also shows a Milly W. Lewes being granted title on July 2, 1866, to 80 acres of T5N R1W, Section 35 (1820 Sale-Cash Entry), and 40 acres of T5N R1W, also in Section 35 (1820 Sale-Cash Entry). An 1863 cadastral map (tax map) for T5N R1E, shows an area of Section 30 claimed by "A.L. Lewis". The 1864 cadastral map for T5N R1W, shows an area of Section 25 claimed by "A. Lee Lewis". The Washington community of Woodland is located on the Lewis River floodplain, an area once inundated by the massive floodwaters of the Missoula Floods. The Lewis River and its tributary the East Fork Lewis River cut their channels into Missoula Flood deposits. "During glacial maxima, sea level was as much as 400 feet (120 meters) lower than at present. 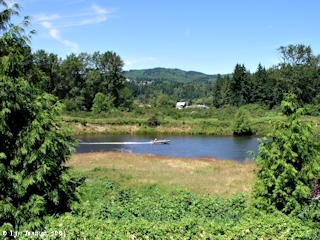 The Columbia River in response deeply incised its bed, flowing through a narrow valley about two kilometers west of the map area (Ridgefield Quad). The Lewis and East Fork Lewis Rivers presumably also adjusted to lower base level at these times. 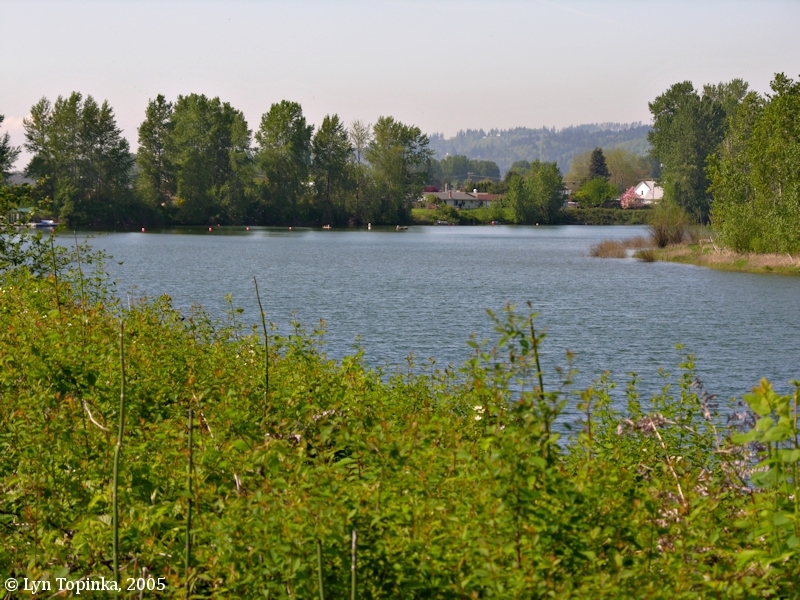 Late in the last glacial period, huge glacier-outburst floods from Glacial Lake Missoula coursed down the Columbia River valley and hydraulically ponded in the Portland Basin; silt and fine sand that settled out of this temporary lake now cover much of the map area. As sea level rose during the late Pleistocene and Holocene, the late Pleistocene valleys gradually filled with sediment." "During the last glacial maximum in late Pleistocene time, an ice dam impounded Glacial Lake Missoula in western Montana. The dam failed repeatedly, releasing floods that coursed down the Columbia River and into the Portland Basin. 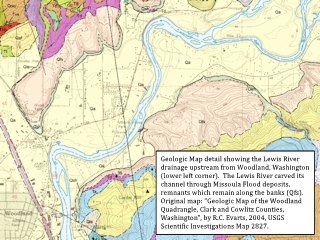 The sediment-laden floodwaters were hydraulically constricted by the narrow reach of the Columbia River valley north of (downstream from) the Ridgefield quadrangle. The constriction caused temporary ponding in the Portland Basin and tribuatry valleys to levels as high as 400 feet (120 meters). Radiocarbon ages, paleomagnetic measurements, and tephrochronologic data indicate that the last glacial episode of floods occurred chiefly between about 17,000 and 13,000 14C years B.P. Similar episodes of cataclysmic flooding probably occurred earlier in the Quaternary. During each flood, the suspended load of fine sand and silt settled out of the temporarily ponded floodwaters. 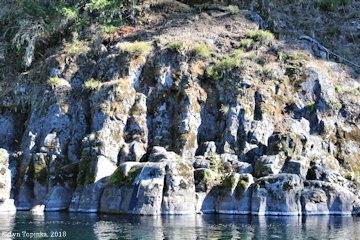 In the northern Portland Basin, multiple floods collectively built up deposits of laminated micaceous sediments as thick as 100 feet (30 meters). These slack-water deposits (Qfs), which grade almost imperceptively northward from fine sand to silt, now mantle the entire surface of the Ridgefield quadrangle south of the East Fork Lewis River. Partly eroded flood deposits lie north of the river between 200 and 300 feet (60 and 75 meters) elevation, and local unmapped patches of micaceous silt are found at elevations up to 400 feet (120 meters)." 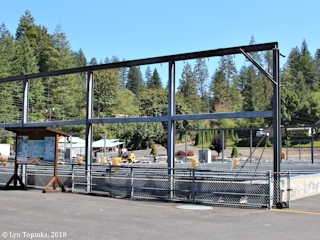 "Remnants of a terrace with surface elevations of 110 to 140 feet (33 to 43 meters) lie along the south bank of the Lewis River directly downstream from its confluence with the East Fork Lewis River. The terrace deposits (Qtd) consist of unconsolidated, poorly sorted sandy pebble gravel and lithic sand overlain by micaceous silt of Missoula-floods origin (Qfs). Terrace-gravel clasts are chiefly Tertiary volcanic rocks eroded from the Cascade Range, indicating that the terrace sediment was carried by the Lewis River rather than the Columbia." Source: R.C. Evarts, 2004, "Geologic Map of the Ridgefield Quadrangle, Clark and Cowlitz Counties, Washington", USGS Scientific Investications Map 2844. 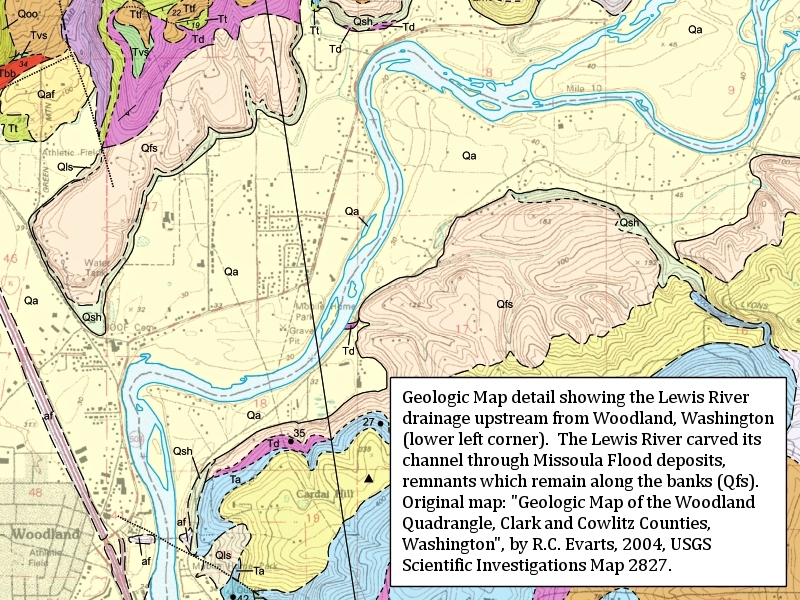 Click image to enlarge Geologic Map detail, Lewis River upstream from Woodland, Washington. Original map: R.C. Evarts, 2004, Geological Map of the Woodland Quadrangle, Clark and Cowlitz Counties, Washington, U.S. Geologic Survey Scientific Investigations Map 2827. 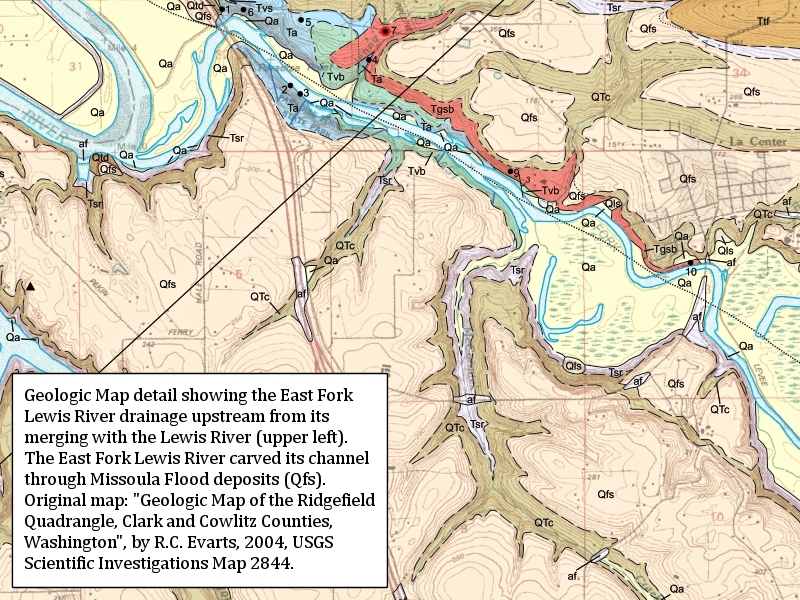 Click image to enlarge Geologic Map detail, East Fork Lewis River upstream from merging with the Lewis River, Woodland, Washington. Original map: R.C. 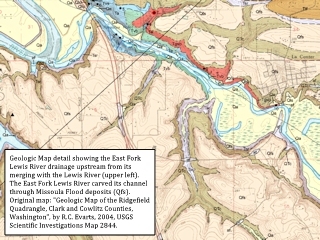 Evarts, 2004, Geological Map of the Ridgefield Quadrangle, Clark and Cowlitz Counties, Washington, U.S. Geologic Survey Scientific Investigations Map 2844. Click image to enlarge Scenic, Lewis River, left bank, at Railroad Bridge, Woodland, Washington. Image taken October 14, 2007. 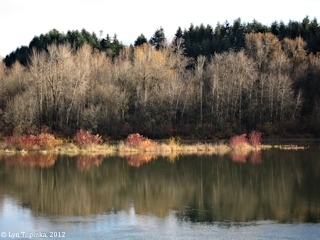 Click image to enlarge Scenic, Lewis River left bank, Woodland, Washington. Image taken March 29, 2007. Click image to enlarge Scenic, Lewis River near its confluence with the Columbia River. Image taken December 5, 2012. Click image to enlarge Reflections, Lewis River near its confluence with the Columbia River. Image taken December 5, 2012. 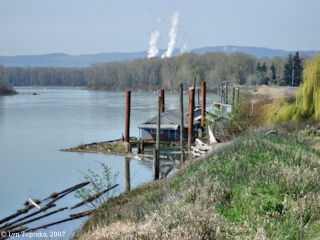 Austin Point is located on the Washington side of the Columbia River at River Mile (RM) 87.5. Austin Point is the downstream bank (right bank) of the Lewis River. 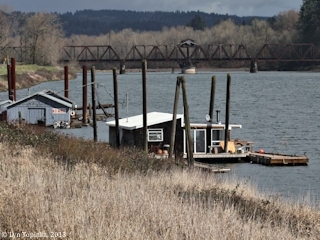 The Lewis River Floodplain extends five miles along the Washington shore, from the mouth of the Lewis River at Columbia River Mile (RM) 87.5, to downstream Burke and Martin Islands, at RM 82.5. 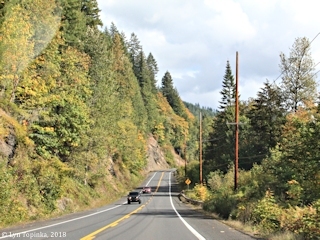 The community of Woodland lies along the right bank of the Lewis River where the Lewis leaves the Cascade foothills and the floodplain begins. 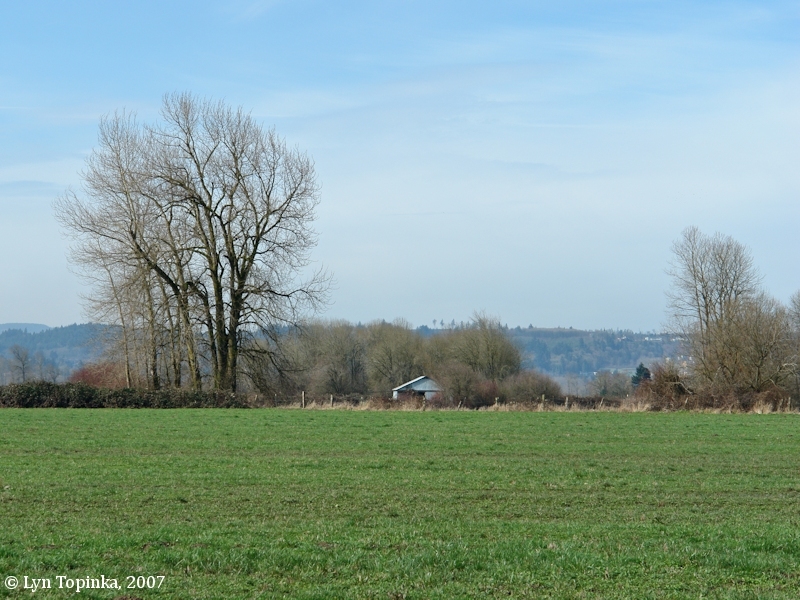 Click image to enlarge Lewis River Floodplain. Image taken March 4, 2007. 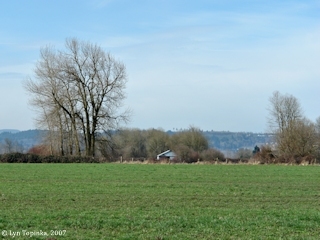 Click image to enlarge Tulip field, Lewis River Floodplain. Image taken April 22, 2007. Right bank along the Dike Road. 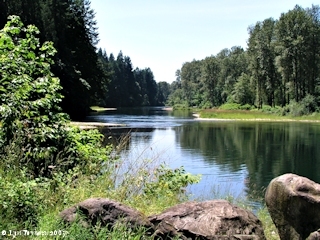 Click image to enlarge Lewis River looking downstream towards Austin Point. Image taken March 29, 2007. 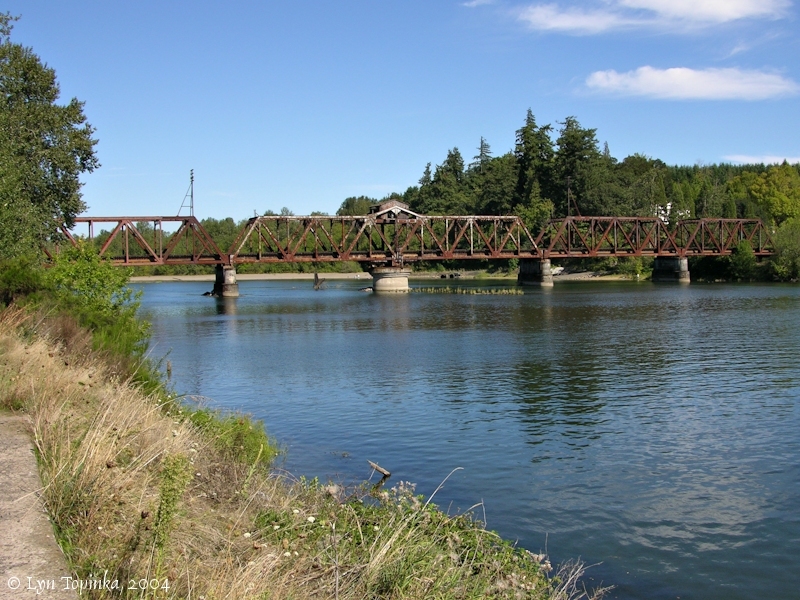 Click image to enlarge Lewis River looking upstream towards BNSF Railroad Bridge. 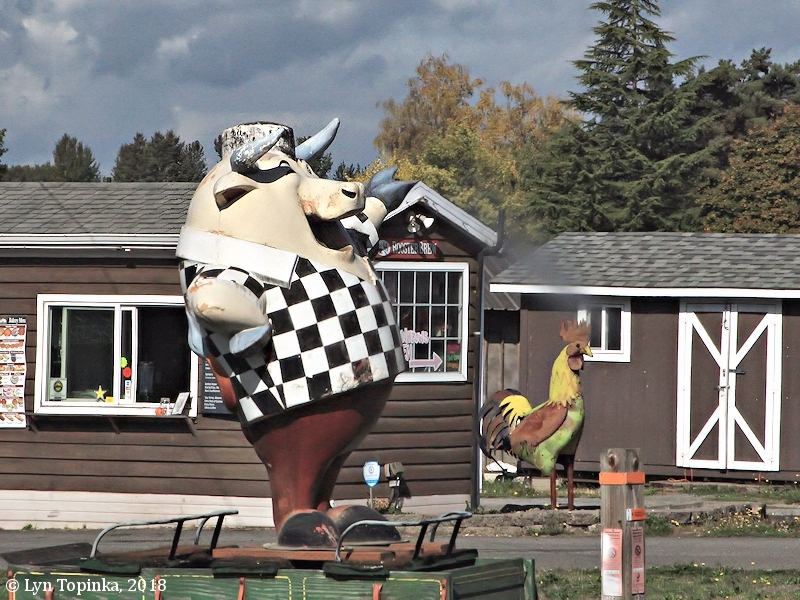 Image taken March 20, 2013. 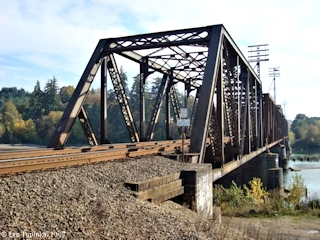 The Burlington Northern Santa Fe tracks cross the Lewis River near its mouth. 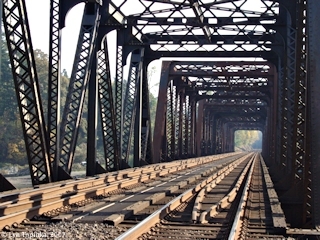 The rail line was completed from Kalama, Washington to Portland, Oregon in 1908. 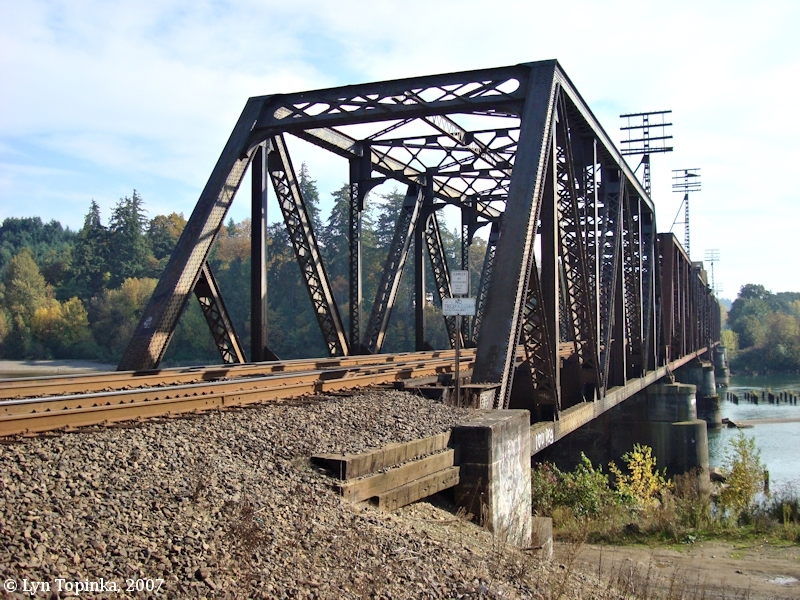 Click image to enlarge Railroad Bridge crossing the Lewis River. 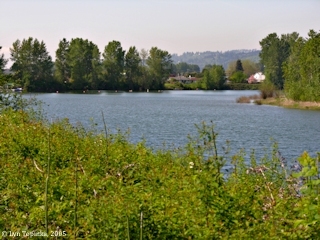 View is from the Lewis River's right bank, just upstream from its confluence with the Columbia River. Image taken August 29, 2004. 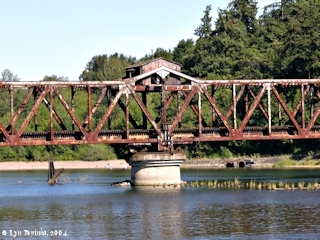 Click image to enlarge Lewis River railroad bridge, Lewis River Floodplain. Image taken October 14, 2007. The East Fork Lewis River has its headwaters near Green Lookout Mountain, and enters the mainstem Lewis at River Mile (RM) 3.5. 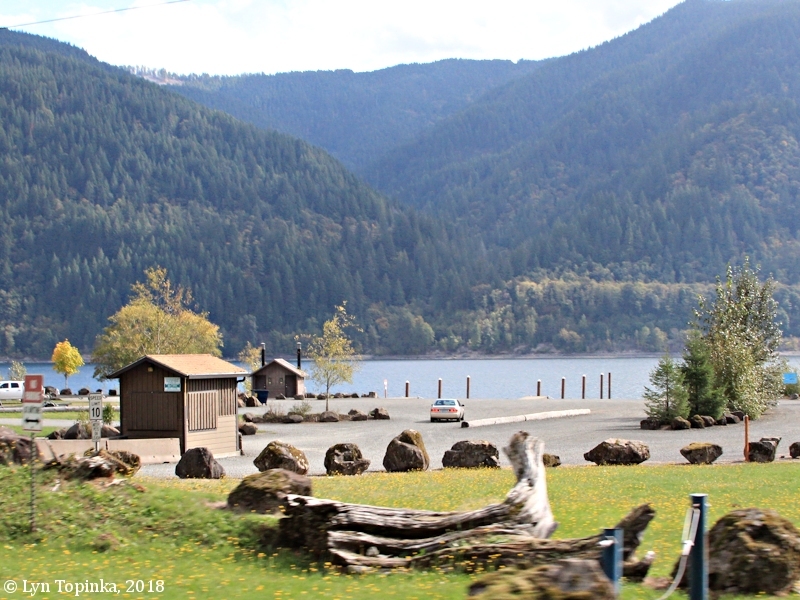 Washington State's Paradise Point State Park is located at RM 1, Daybreak Park at RM 10, Lewisville Park, the first regional park in Clark County, is located at RM 15, and Lucia Falls is located at RM 21.3. Click image to enlarge East Fork Lewis River, from Paradise Point State Park. Image taken May 30, 2006. 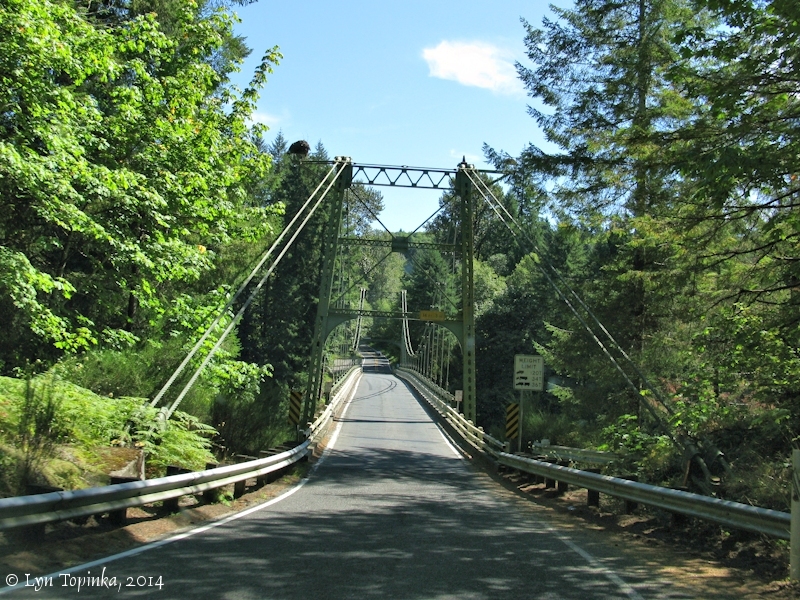 The mainstem of the Lewis River is also known as the North Fork Lewis River. It flows southwesterly from its source at Mount St. Helens and Mount Adams through three reservoirs (Swift Reservoir at River Mile (RM) 47.9, Yale Reservoir at RM 34.2, and Merwin Lake at RM 19.5) and then forms a canyon to the confluence of Cedar Creek at RM 15.7. The lower 12 miles of the mainstem Lewis flows through a wide flat valley, much of which is under cultivation and protected from flooding by dikes. 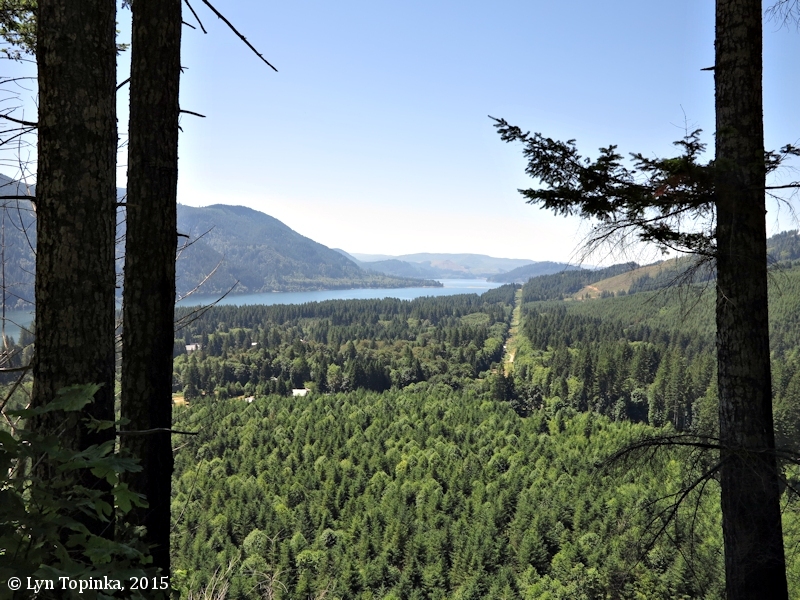 The lower 11 miles are a tidally influenced backwater of the Columbia River. Within this area, the flow is sluggish and the sediments are generally composed of sand, silts, and clays typical of lower floodplains. 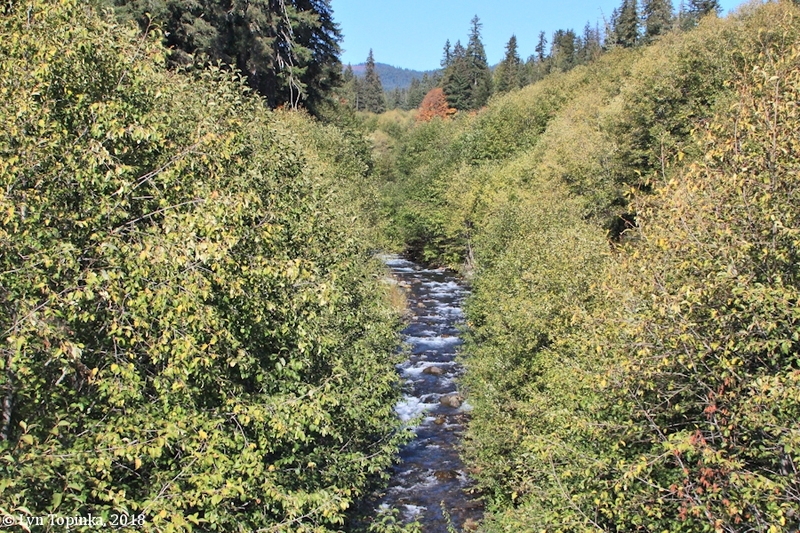 The East Fork of the Lewis River merges with the North Fork at RM 3.5 to form the Lewis. 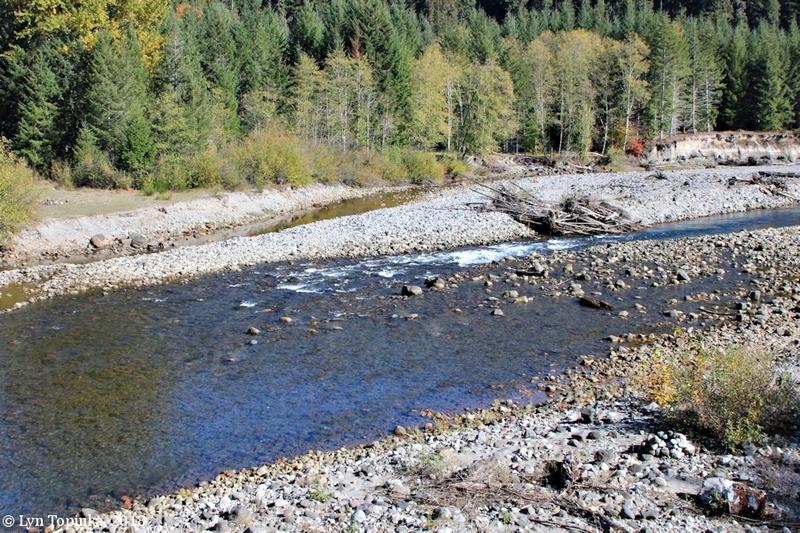 Click image to enlarge North Fork Lewis River at Cedar Creek, looking downstream. Image taken July 4, 2005. Click image to enlarge Kayaks, North Fork Lewis River at Cedar Creek. Image taken July 4, 2005. 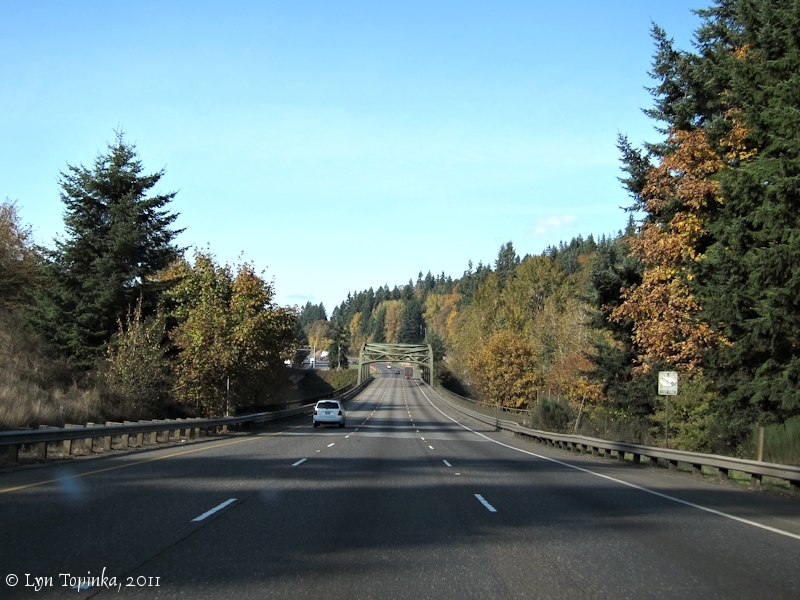 Interstate 5 first crosses the East Fork Lewis River and 1.6 miles later it crosses the mainstem Lewis River (North Fork Lewis River) at Lewis River's RM 5.5. 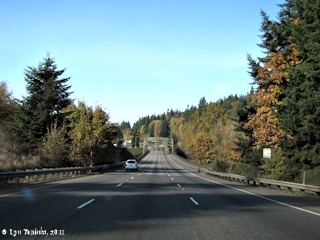 Click image to enlarge Interstate 5 approaching the Lewis River drainage, near Woodland, Washington. Image taken November 8, 2011. 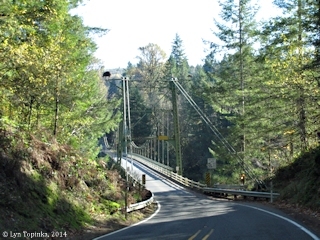 Click image to enlarge Interstate 5 crossing the East Fork Lewis River, near Woodland, Washington. Image taken November 8, 2011. 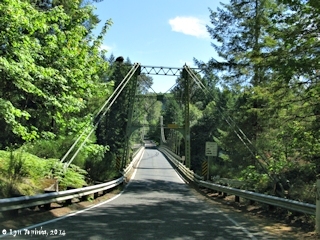 Click image to enlarge Interstate 5 crossing the mainstem Lewis River (North Fork Lewis River), near Woodland, Washington. Image taken November 8, 2011. 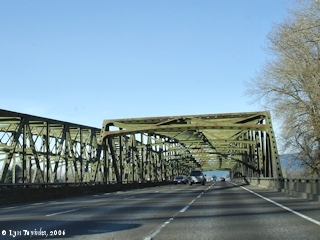 Click image to enlarge Interstate 5 bridge across the Lewis River, heading north. Image taken December 2, 2006. 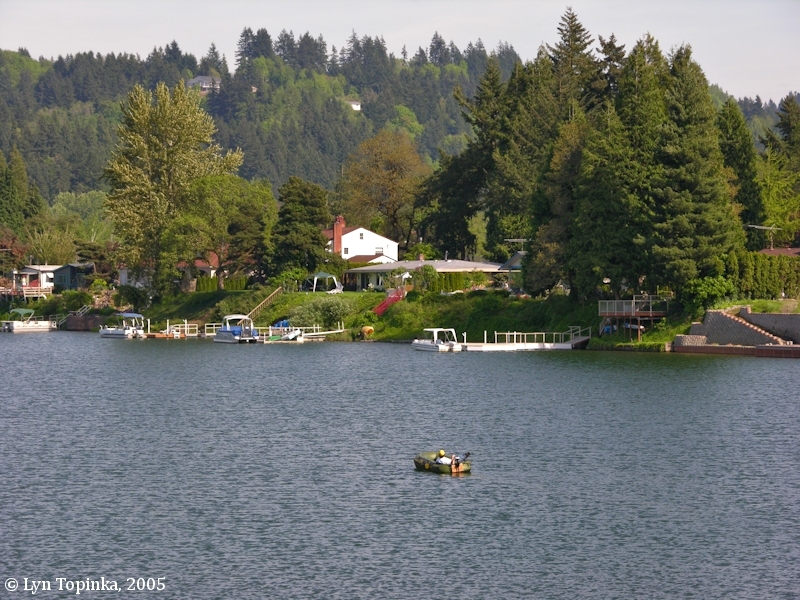 Horseshoe Lake is a man-made cutoff meander of the Lewis River. 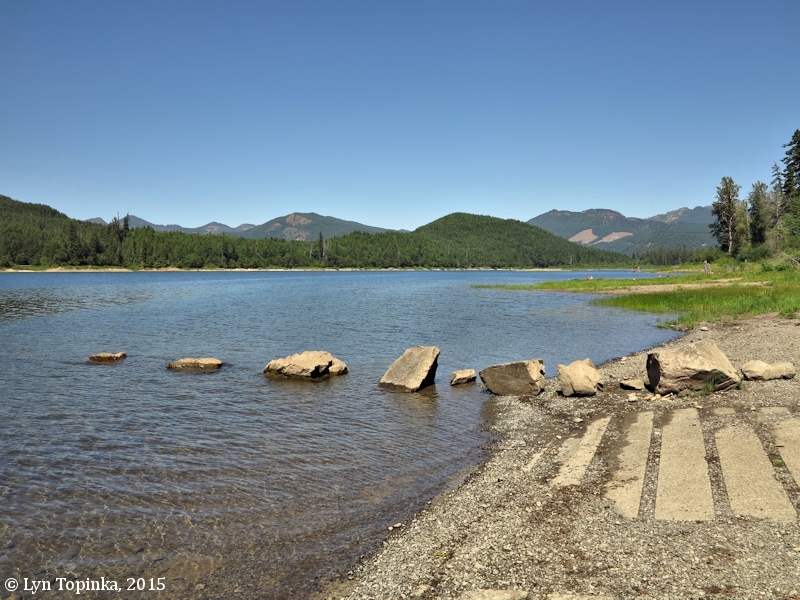 In 1940 the 90-acre horseshoe-shaped lake was created with construction of U.S. Highway 99. 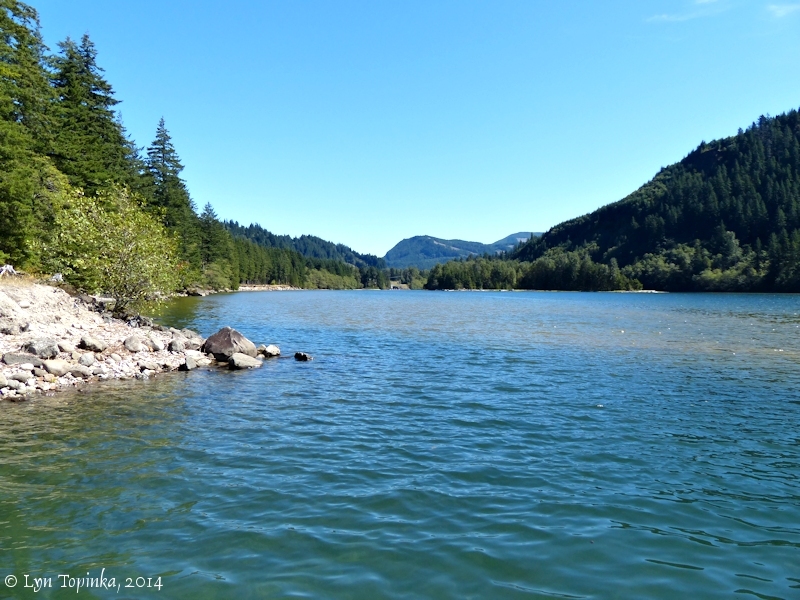 Click image to enlarge Horseshoe Lake, Woodland, Washington. Image taken April 27, 2005. Click image to enlarge Fisherman, Horseshoe Lake, Woodland, Washington. Image taken April 27, 2005. Woodland, Washington, is located on the Lewis River at Lewis River Mile (RM) 6.5, upstream from the Lewis River's junction with the Columbia River at RM 82. A broad floodplain lies between the community and the Columbia River. 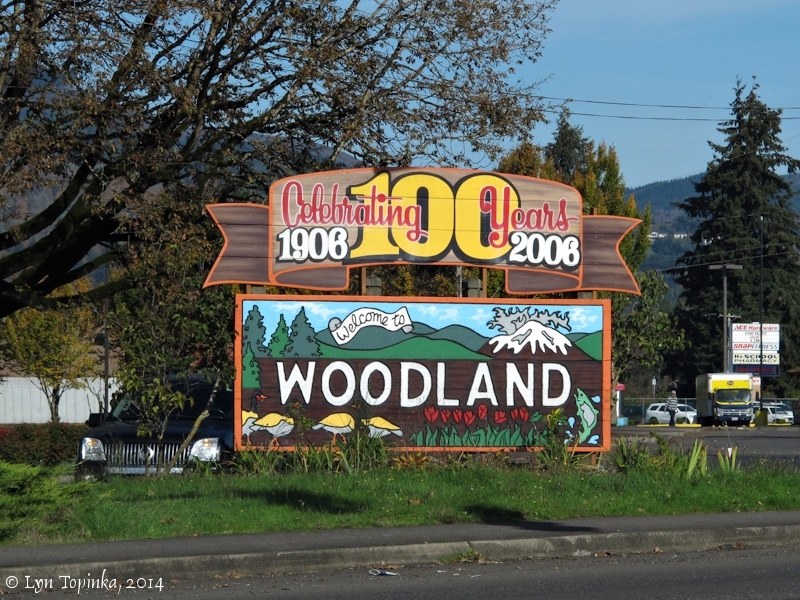 Woodland is famous for its lilacs, daffodils, and tulip fields. Click image to enlarge Sign, "Welcome to Woodland", Woodland, Washington. Image taken November 8, 2014. 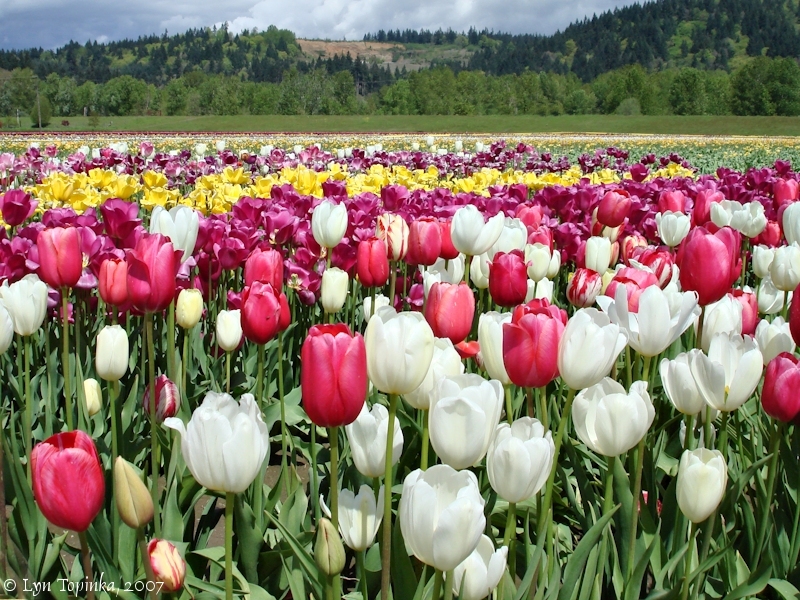 Click image to enlarge Tulip field, Woodland, Washington. Image taken April 22, 2007. 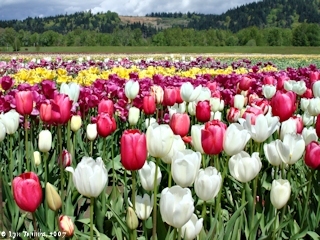 Click image to enlarge Tulip show field, Lewis River Floodplain. Image taken April 13, 2013. 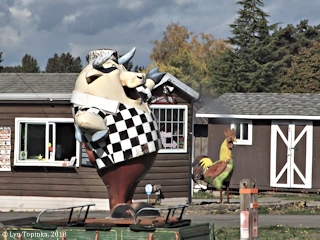 Click image to enlarge "Rooster Brew", Lewis River Road, Clark County, Washington. Image taken October 4, 2018. 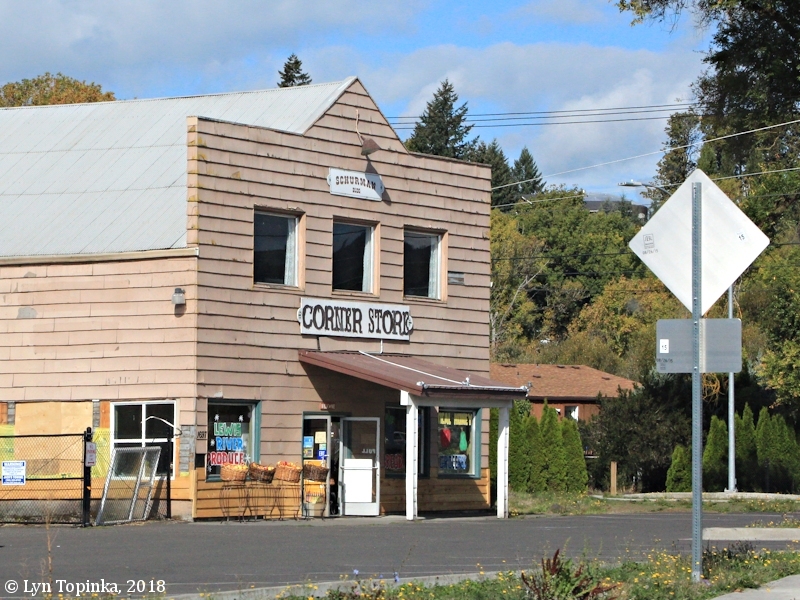 Click image to enlarge "Corner Store", Lewis River Road, Clark County, Washington. Image taken October 4, 2018. Click image to enlarge Heading east, Lewis River Road, Clark County, Washington. Image taken October 4, 2018. 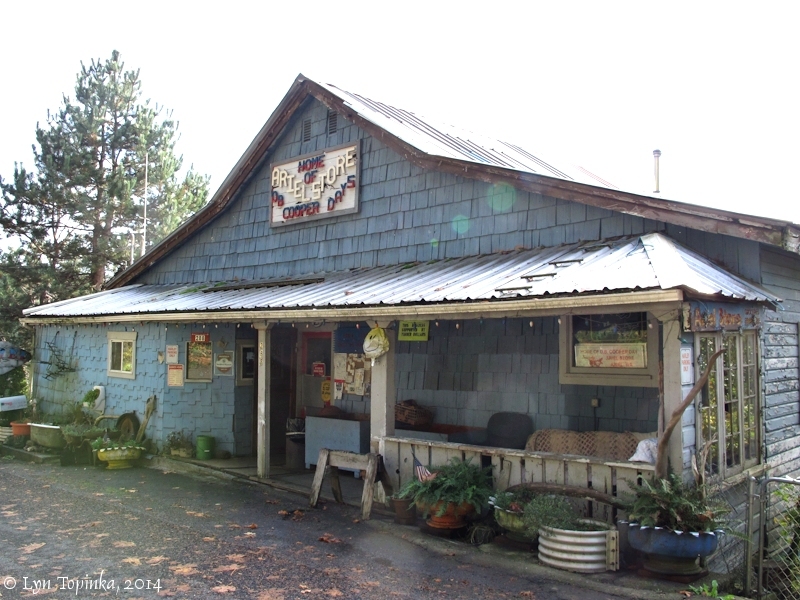 Cedar Creek flows north and enters the mainstem Lewis River (North Fork Lewis River) at RM 15.5, just opposite of the Lewis River State Fish Hatchery. 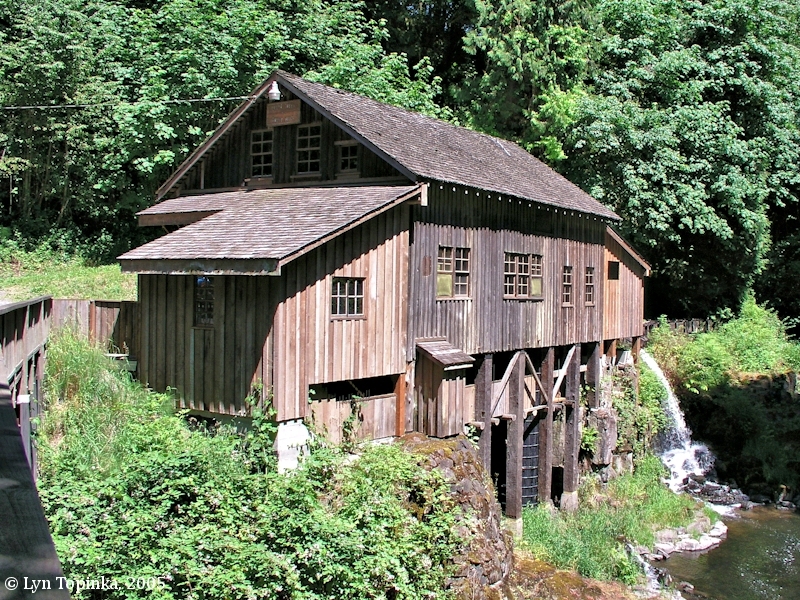 The Cedar Creek Grist Mill is located just upstream of the Cedar River's confluence with the mainstem Lewis River. The grist mill was built in 1876 and is still operational. The mill was listed on the Clark County Heritage Register in 1986 and listed on the National Register of Historic Places in 1975 (Building - #75001844). 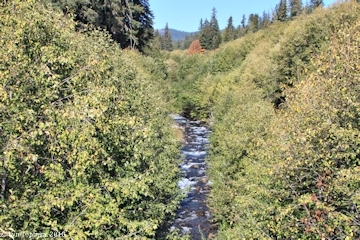 Click image to enlarge Cedar Creek at mouth, looking downstream towards the Lewis River. Image taken July 4, 2005. 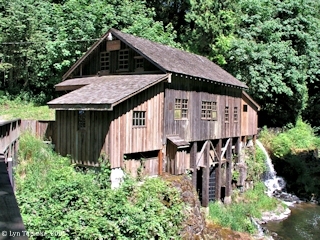 Click image to enlarge Cedar Creek Grist Mill near Woodland, Washington. Image taken July 4, 2005. 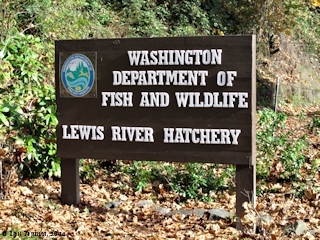 Click image to enlarge Sign, Lewis River Hatchery, Woodland, Washington. Image taken November 8, 2014. 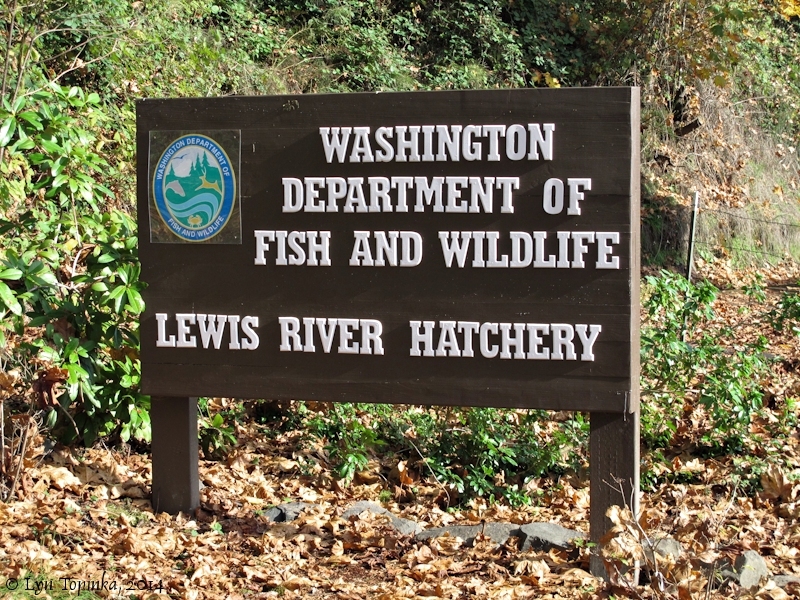 Click image to enlarge Lewis River Hatchery, Woodland, Washington. Image taken November 8, 2014. 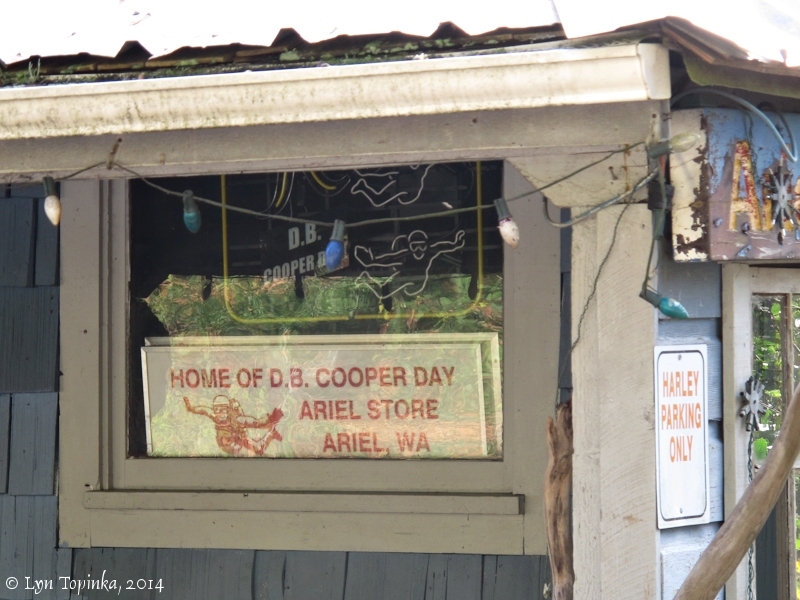 "Ariel: The site of the annual D.B. Cooper festival, this community on the road to Lake Merwin Park was named for the first born son of the postmaster, Leander Chitty." 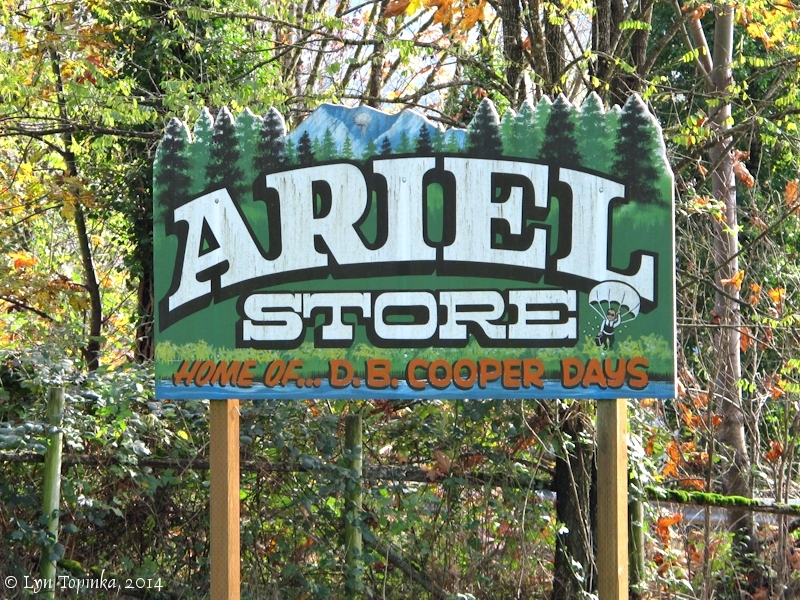 Click image to enlarge Sign, Ariel Store, "Home of ... D.B. 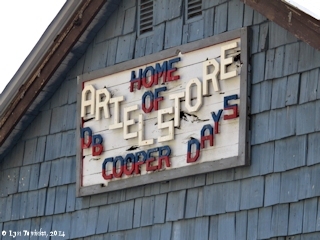 Cooper Days", Ariel, Washington. Image taken November 8, 2014. 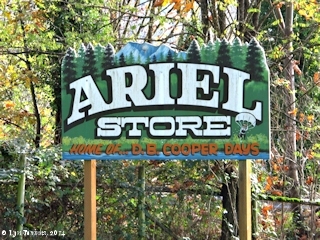 Click image to enlarge Ariel Store, Ariel, Washington. Image taken November 8, 2014. 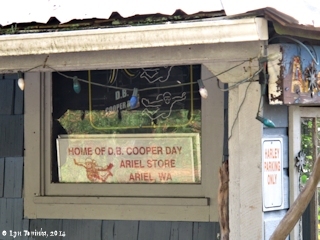 Click image to enlarge Ariel Store (with sun glare), Ariel, Washington. Image taken November 8, 2014. "Placed in service in 1931, the Merwin project has a generating capacity of 136 mw. The dam associated with this plant is a 313-foot high concrete arch type. 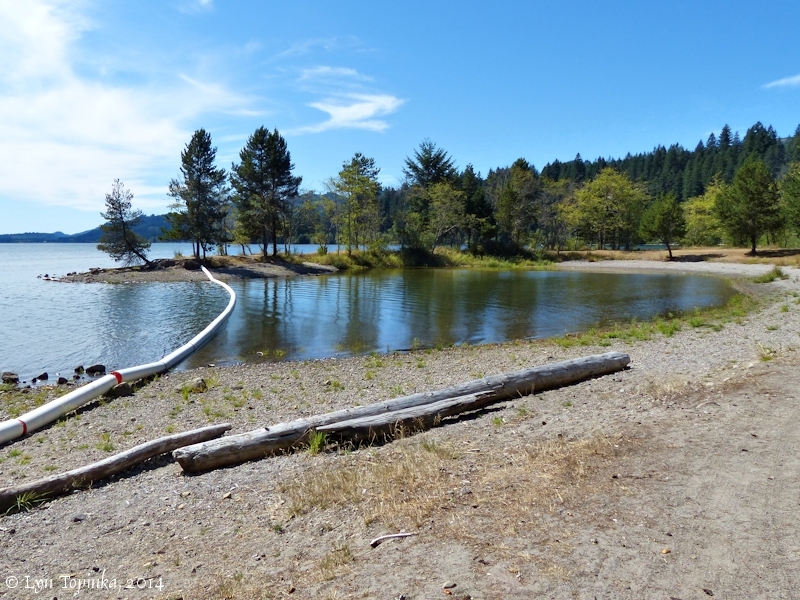 It creates Merwin Lake, a 4,040-acre impoundment popular with a wide variety of recreationists." 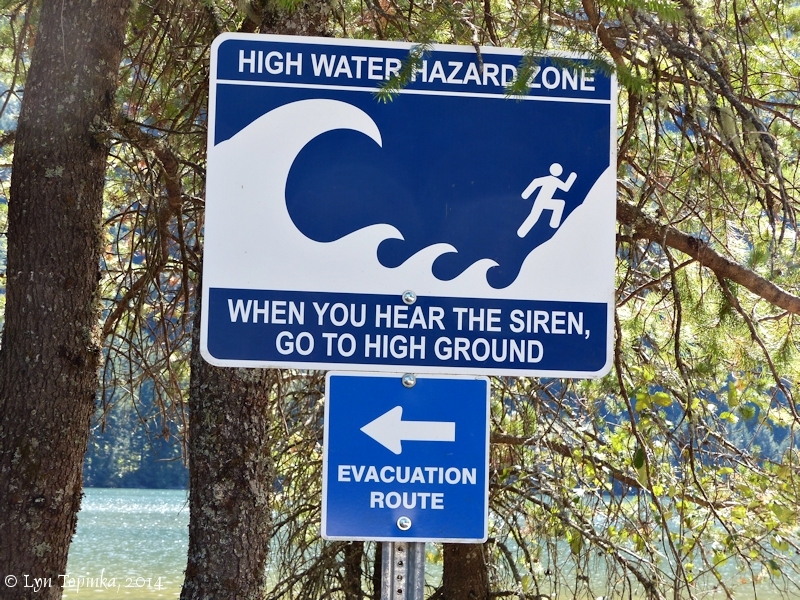 Source: PacifiCorp website, 2018, "Lewis River". 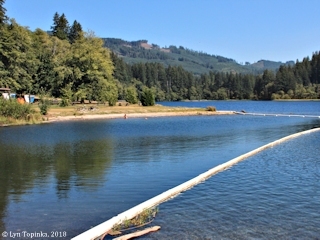 Lake Merwin (also called Merwin Reservoir) is a 4,040-acre reservoir behind Merwin Dam, located 19 miles upstream on the North Fork Lewis River. Merwin Dam is the lower of three dams belonging to the Pacific Corps' "Lewis River Hydroelectric Project". The dams were constructed between 1931 and 1959 and generate 510 megawatts of energy (2011). 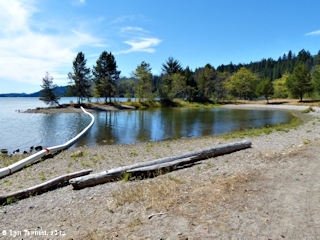 Three recreational sites are located on Lake Merwin. 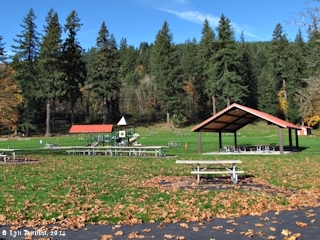 Merwin Park, Speelyai Park, and Cresap Bay Park have a combined 177 picnic tables, 78 campsites, and two boat launch docks (2011). Merwin Dam was placed in service in 1931 and generates 136 megawatts. It is a 313-foot high concrete arch dam. "Lake Merwin: A 12-1/2 miles east of Kalama, in North Fork, Lewis River, southeast Cowlitz County. It was created by Northwestern Electric Company when Ariel Dam was built. The lake was named by H.J. Campbell, publisher of Vancouver Columbian, for L.T. Merwin of Northwestern Electric Company. 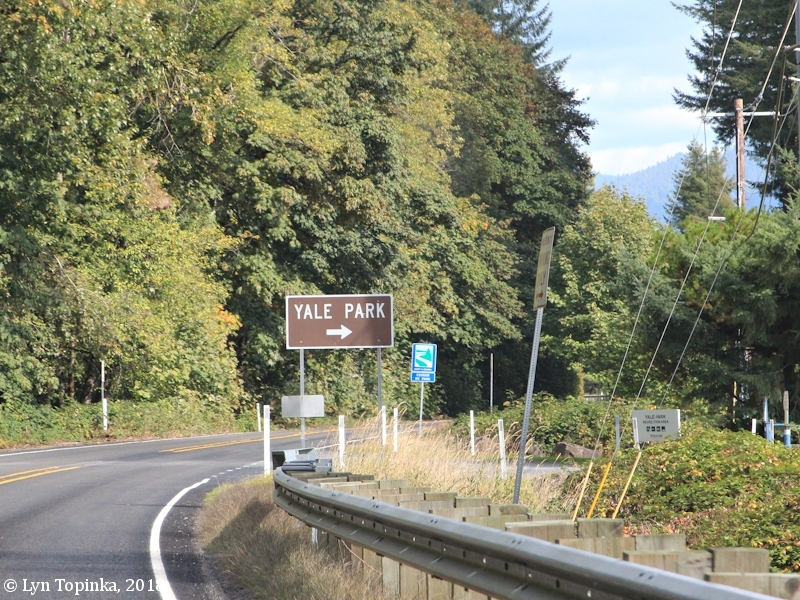 An earlier name was Yale Lake." "Merwin Lake: The dam on the Lewis River was finished in 1931. Without ceremony, on May 13, the gates were closed and water began to fill the lake. 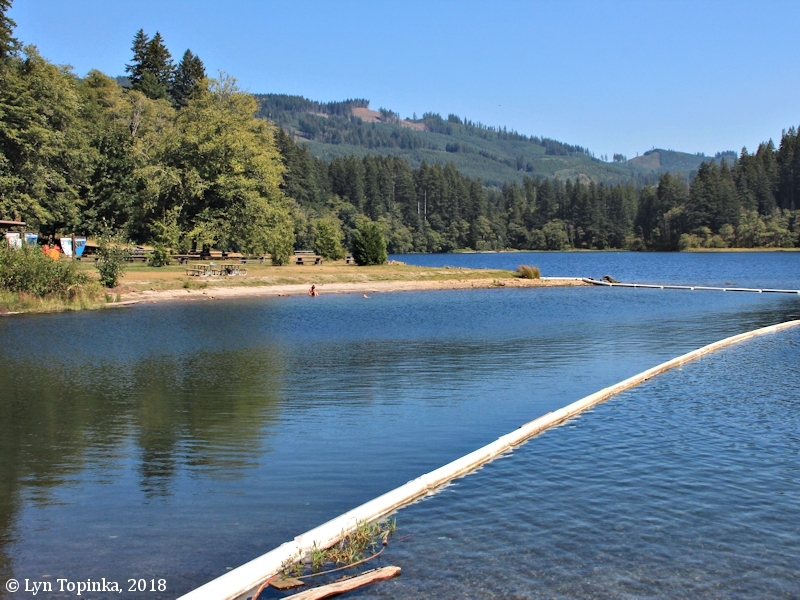 Since the dam was north of the town of Ariel, in Cowlitz County, the dam and the lake that formed behind it were called “Ariel.” On May 1, 1948, in a simple ceremony, the name was changed to “Merwin” for L.T. 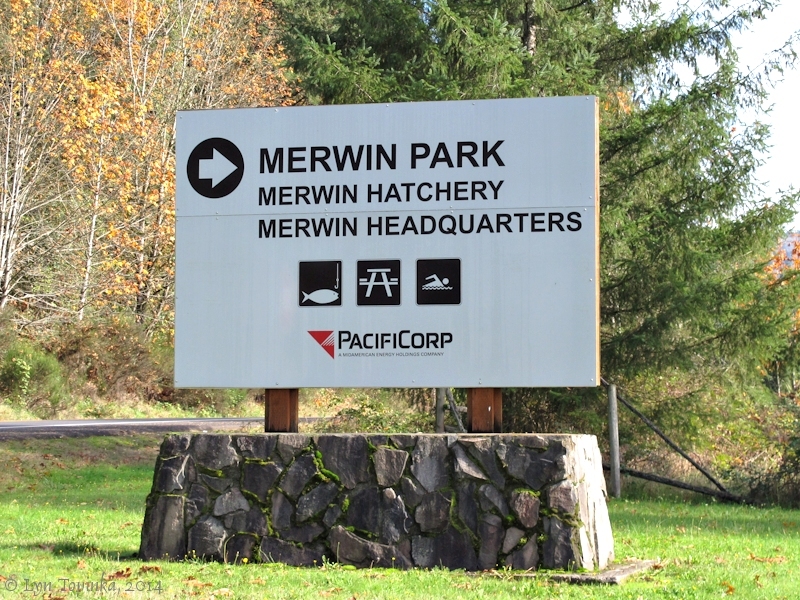 Merwin, the vice-president of the Pacific Power and Light company, which owns the dam." 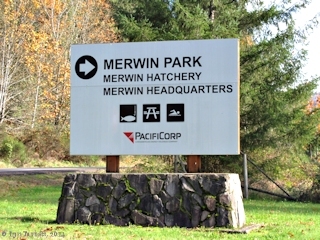 Click image to enlarge Sign, Merwin Park, Lake Merwin, Washington. Image taken November 8, 2014. 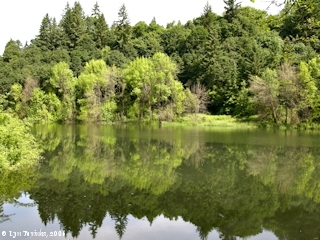 Click image to enlarge Lake Merwin as seen from Merwin Park, Washington. Image taken November 8, 2014. 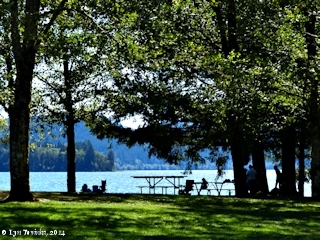 Click image to enlarge Merwin Park, Lake Merwin, Washington. Image taken November 8, 2014. Click image to enlarge Speelyai Bay, Washington. Image taken August 29, 2018. 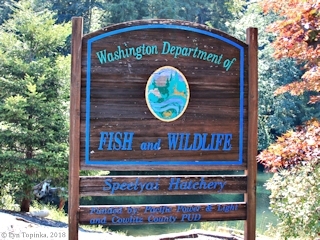 Click image to enlarge Sign, Speelyai Hatchery, Lewis River, Washington. Image taken August 29, 2018. 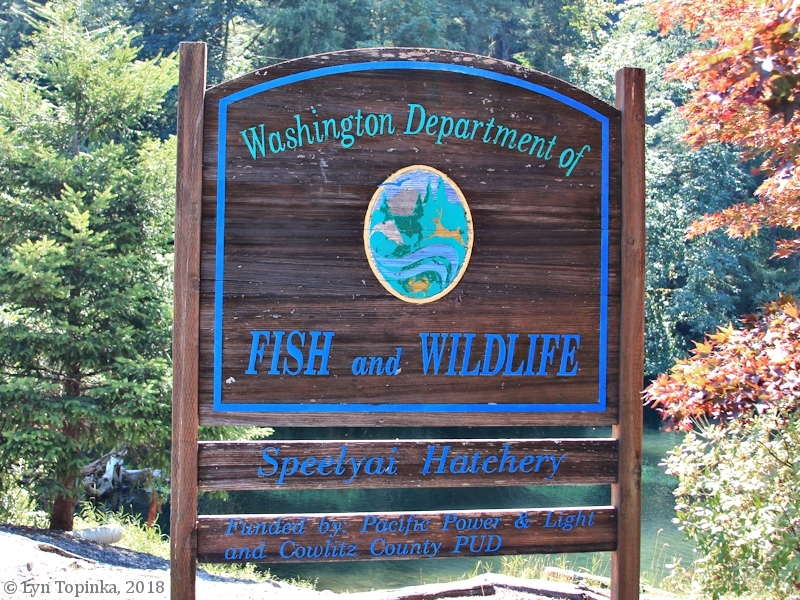 Click image to enlarge Speelyai Hatchery, Lewis River, Washington. Image taken August 29, 2018. 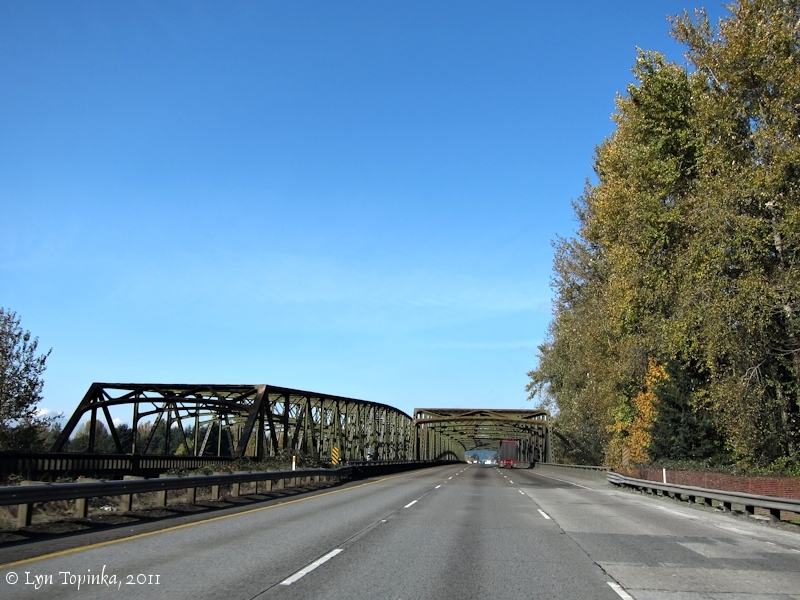 The Yale Bridge, also known as the "Lewis River Bridge" and the "Washington Highway 503 Bridge", was first built in 1932 by the combined counties of Clark and Cowlitz, and is the only steel short-span suspension bridge in Washington. 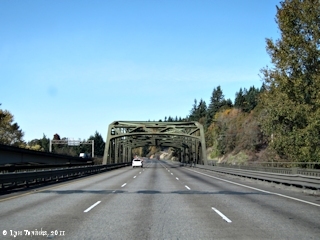 The bridge was rebuilt in 1957 and 1958. 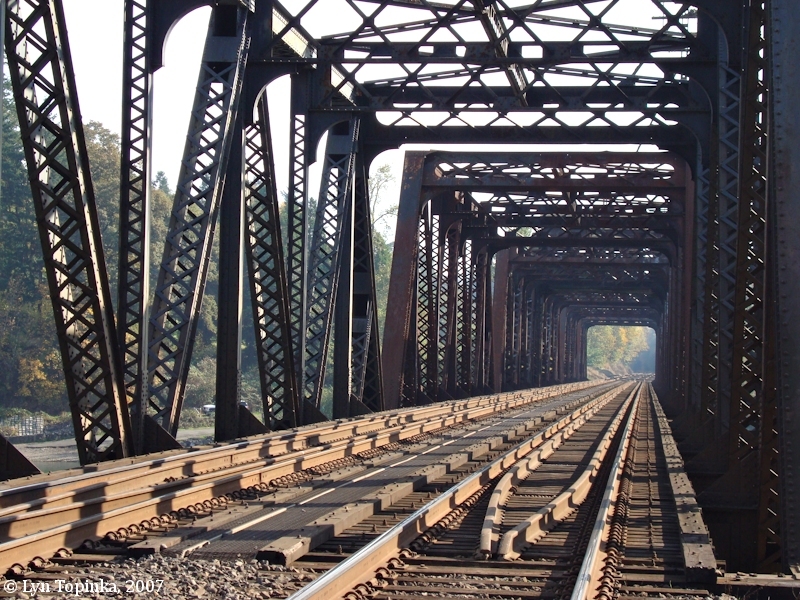 In 1982 the bridge was listed on the National Register of Historic Places (Engineering/Transportation #82004206). 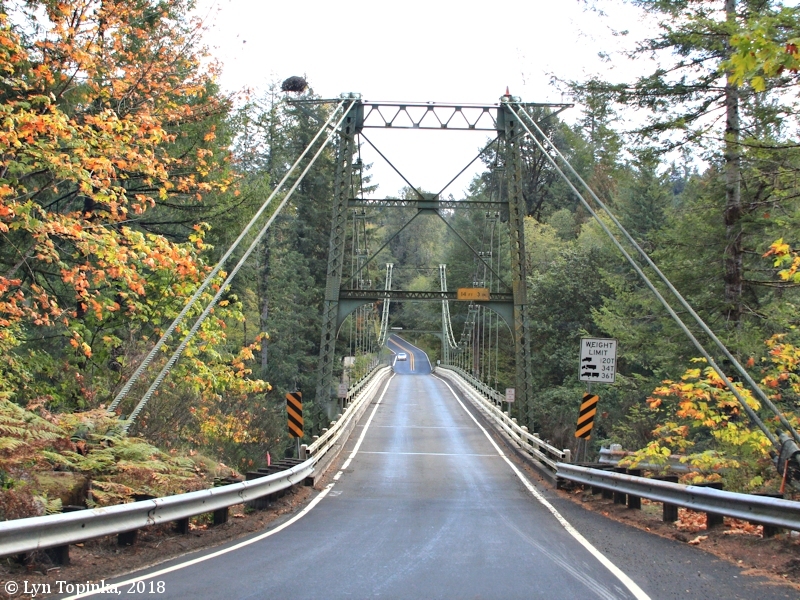 "In 1932, Clark and Cowlitz County jointly constructed a short-spanned steel suspension bridge across the Lewis River to replace a steel truss that had been demolished as a result of the construction of the Ariel Dam. 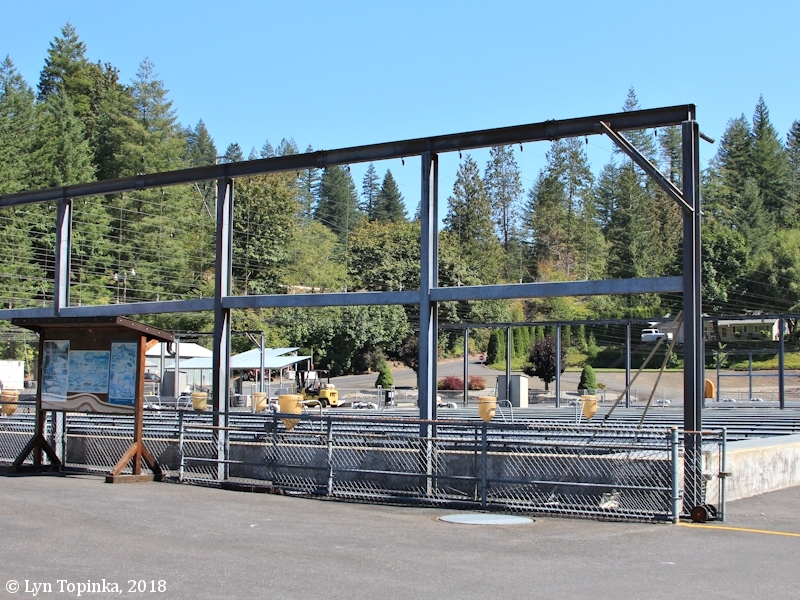 Because the backwater from the dam created a depth of 90 feet at the bridge site, it made it unusually difficult to build falsework, a prerequisite for the construction of the traditional type of highway bridge. Consequently, it was necessary to turn to other, less conventional solutions to forge the river. The bridge was designed by Harold H. Gilbert, and was built by the Gilpin Construction Company of Portland, Oregon. 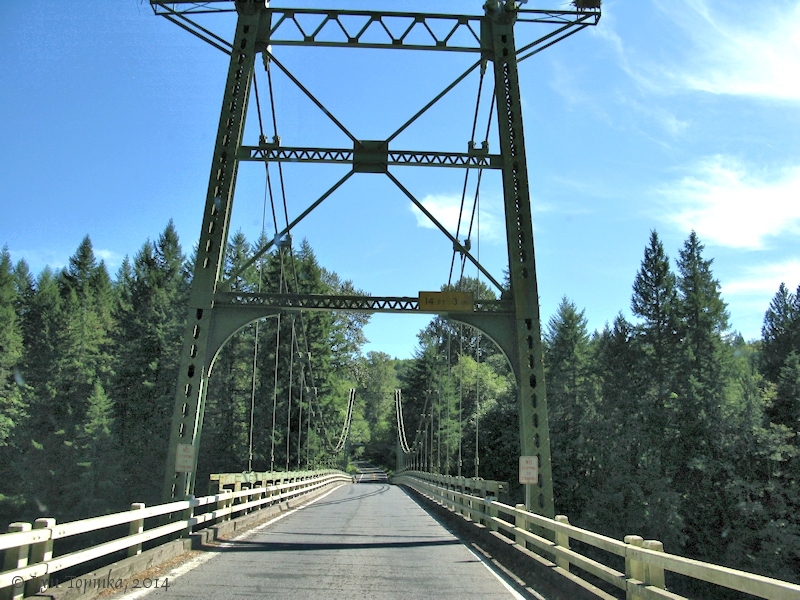 Although there are numerous examples of timber suspension bridges throughout the State, the Yale Bridge is the only example of a short-span steel suspension bridge. The visual impact of the form of the parabolic curve of the cable stretching between two towers, has an unrelenting, universal appeal. 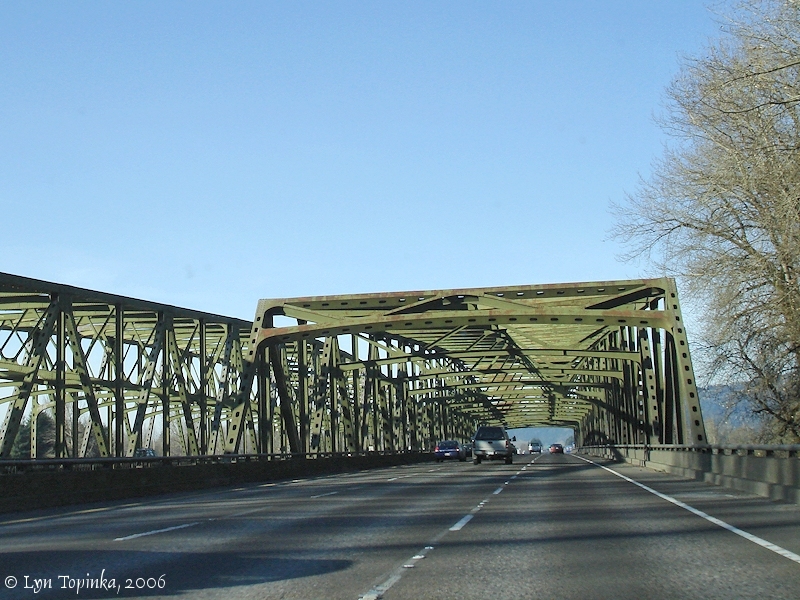 However, the short-span steel suspension bridge has remained rare, because cost factors have prevented it from competing with simple steel trusses, cantilevers, or arches for ordinary highway structures." Source: U.S. National Register of Historic Places Nomination Form, 1982. Click image to enlarge Yale Bridge (Highway 503), looking south, crossing the Lewis River, Washington. Image taken November 8, 2014. 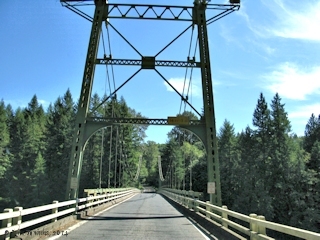 Click image to enlarge Yale Bridge (Highway 503), looking south, crossing the Lewis River, Washington. Image taken September 4, 2014. Click image to enlarge Yale Bridge (Highway 503), looking south, crossing the Lewis River, Washington. Image taken October 4, 2018. 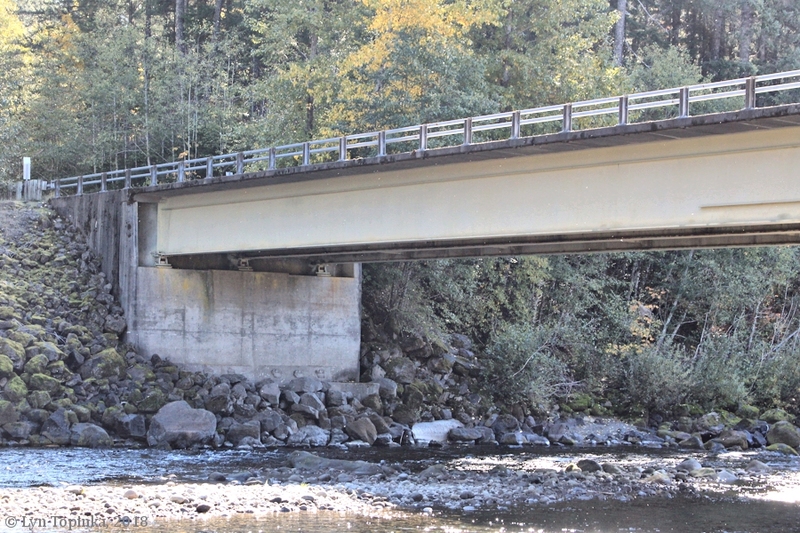 Canyon Creek merges with the Lewis River at RM 33. 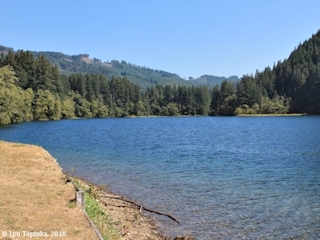 The 19-mile-long creek heads at ZigZag Lake, southeast of Green Lookout Mountain, and basically flows northwest until merging with the mainstem Lewis. 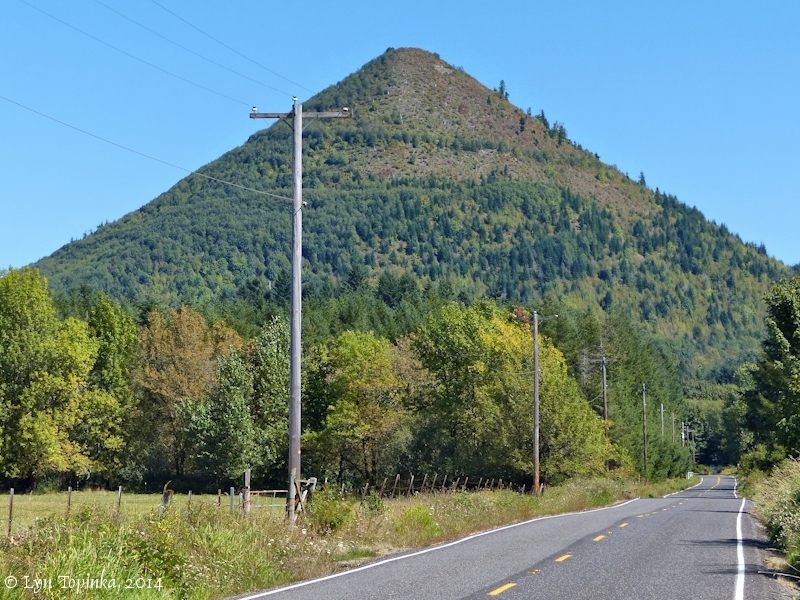 At Canyon Creek RM 2, lies Tumtum Mountain, an eroded conical lava dome. Click image to enlarge Tumtum Mountain, Washington. Image taken September 4, 2014. The Saddle Dam Park is a day-use site with restrooms, fishing access, and a boat launch. Yale Dam is a 323-foot high earthfill embankment dam which was completed in 1953. "The Yale project was completed in 1953. 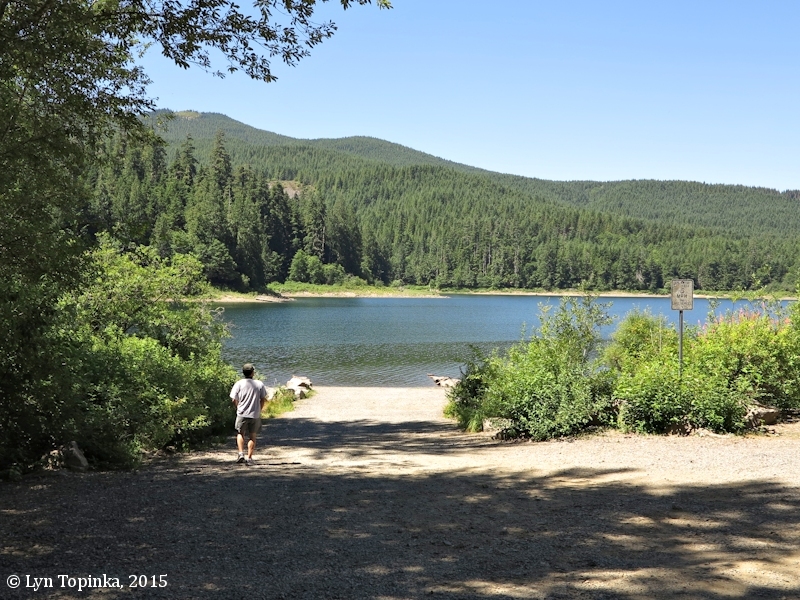 It features a 3,780-acre reservoir (locally known as Yale Lake, it also is a popular recreation site) and a main earthfill embankment dam that is 323 feet high. The two turbines in the Yale powerhouse were recently upgraded to a combined rated capacity of 134 mw." 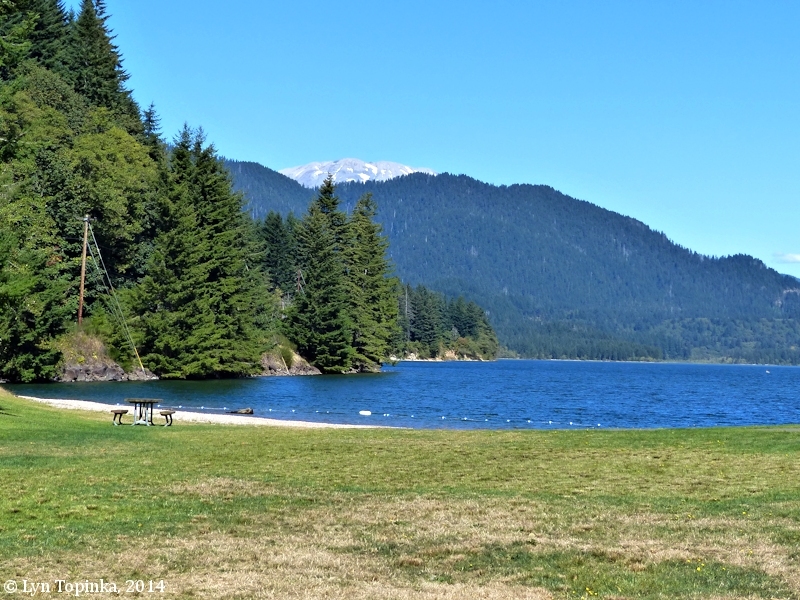 Yale Lake (also called Yale Reservoir) is a 3,780-acre reservoir behind Yale Dam and is located on the North Fork Lewis River, 34 miles upstream of its confluence with the Columbia River. 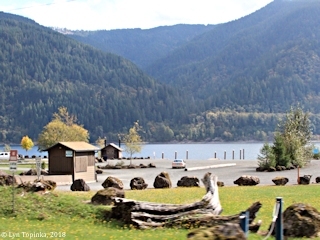 Yale Lake has four recreational parks (Saddle Dam, Yale Park, Cougar Park and Campground, and Beaver Bay Camp) with a combined 45 picnic tables, 118 campsites, and four boat launch docks (2011). 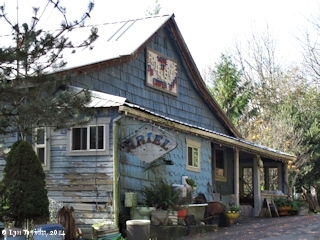 "Yale: Small community 1-1/2 miles north of Lake Merwin's east end, southeast Cowlitz County. The short name was selected by postal officials. An earlier name was SPeillei, for nearby Spillei Creek." 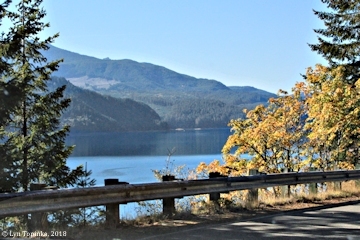 Click image to enlarge Yale Lake as seen from the road to Merrill Lake, Washington. Image taken July 1, 2015. Yale Park, located along Yale Lake (Lewis River) is located within the 1902 Yacolt Burn area. 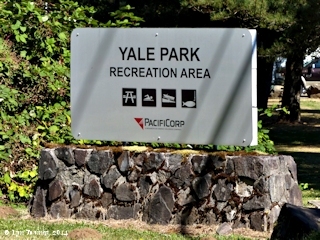 Click image to enlarge Sign, Yale Park, Yale Lake, Washington. Image taken October 4, 2018. Click image to enlarge Yale Lake, Yale Park Recreation Area, Washington. Image taken September 4, 2014. 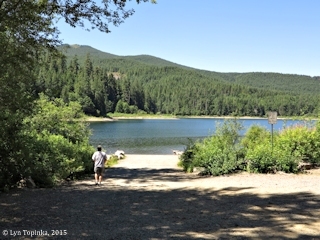 Click image to enlarge Yale Park, Yale Lake, Washington. Image taken October 4, 2018. Click image to enlarge Yale Lake and Mount St. Helens, as seen from Yale Park Recreation Area, Washington. Mount St. Helens is at skyline. Image taken September 4, 2014. Click image to enlarge Picnic at Yale Lake, as seen from Yale Park Recreation Area, Washington. Image taken September 4, 2014. Click image to enlarge Merrill Lake, Washington. Image taken July 1, 2015. 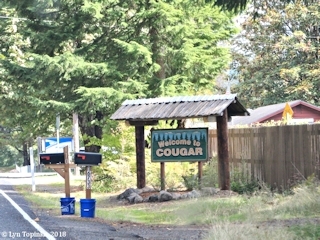 Cougar, Washington, is a small town located at the north end of Yale Lake. 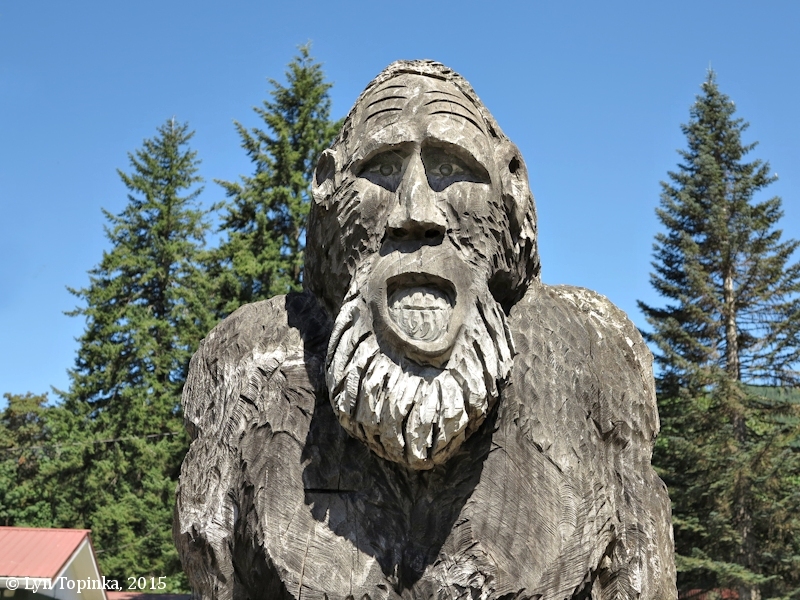 It has two carved Sasquatch. 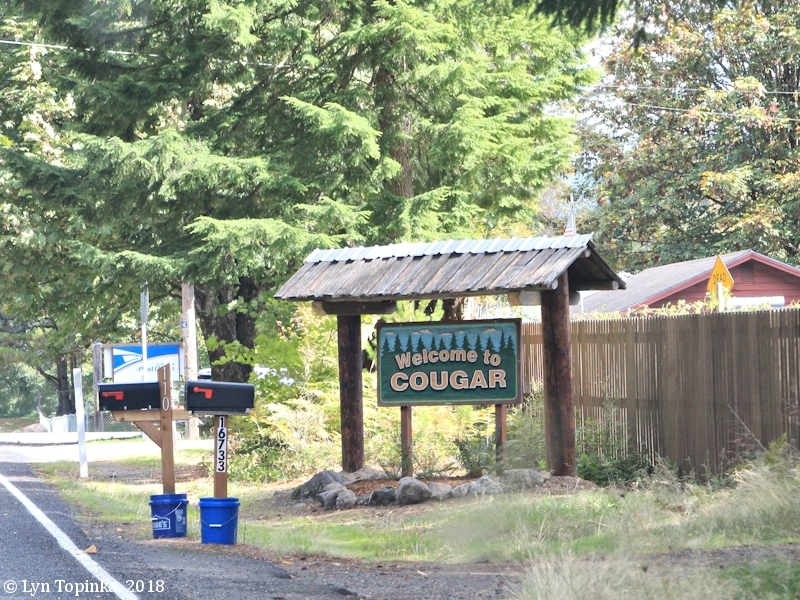 Click image to enlarge "Welcome to Cougar", Washington. Image taken October 4, 2018. 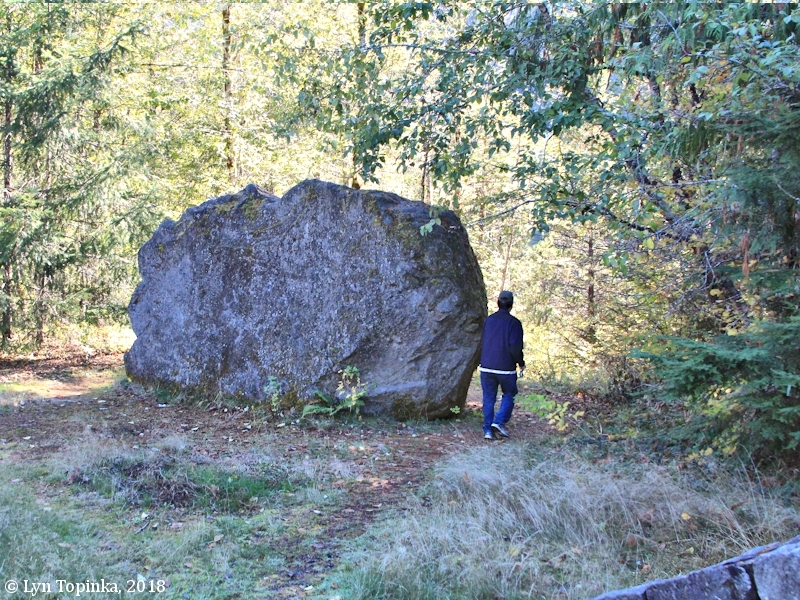 Click image to enlarge Sasquatch, Cougar, Washington. Image taken July 1, 2015. Click image to enlarge Yale Lake, Beaver Bay Recreation Area, Washington. Image taken September 4, 2014. 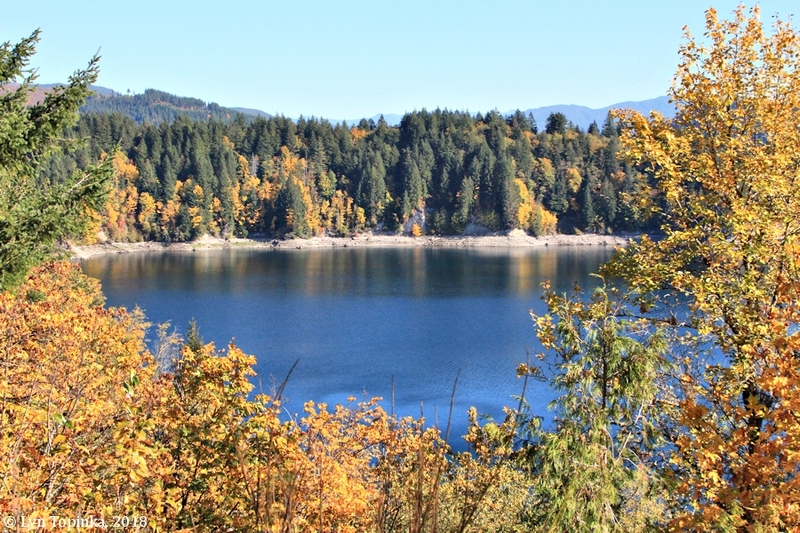 Click image to enlarge Yale Lake, looking east, as seen from Beaver Bay Recreation Area, Washington. Image taken September 4, 2014. 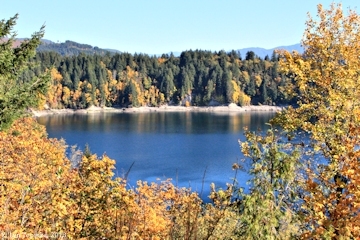 Click image to enlarge Yale Lake, looking west, as seen from Beaver Bay Recreation Area, Washington. Image taken September 4, 2014. 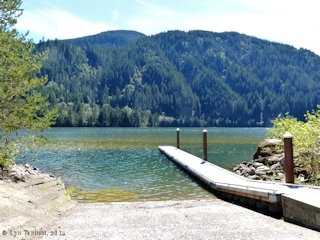 Click image to enlarge Beaver Bay boat launch, Yale Lake, Washington. The Beaver Bay Recreation Area is located just below the Swift Dam. Image taken September 4, 2014. 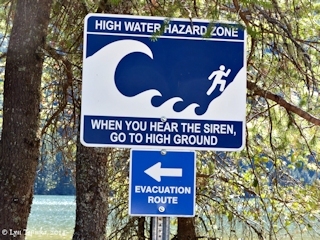 Click image to enlarge "High Water Hazard Zone" sign, Yale Lake, as seen from Beaver Bay Recreation Area, Washington. 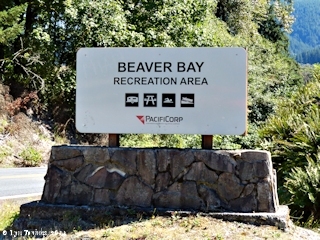 The Beaver Bay Recreation Area is located just below the Swift Dam. Image taken September 4, 2014. Swift Dam, a 512-foot high earthfill dam, was built in 1958. It is one of the highest earthfilled dams in the world. Two hydroelectric facilites are associated with the dam. 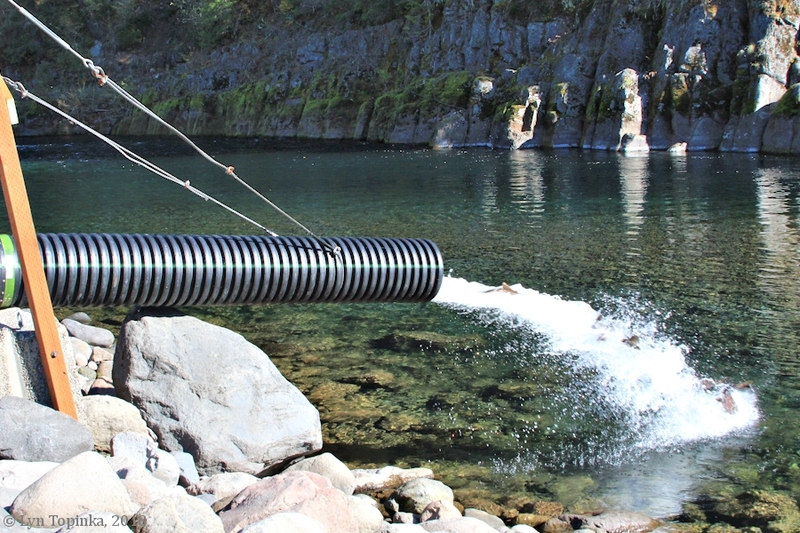 Swift No.1 is located at the dam, with the 3-plus-mile-long Swift Power Canal connecting it to Swift No.2, where the water is then returned to Yale Lake. "At 240 mw, Swift No. 1 is PacifiCorp’s largest hydroelectric facility. When initially built in 1958, the 512-foot Swift Dam was one of the highest earthfill dams in the world. 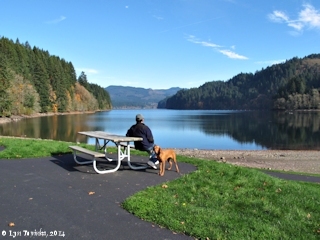 The Swift Reservoir is 4,600 acres and similarly provides a variety of fishing, camping, swimming and other recreation. The discharge of Swift No. 1 enters a canal that transports the water through the 70 mw Swift No. 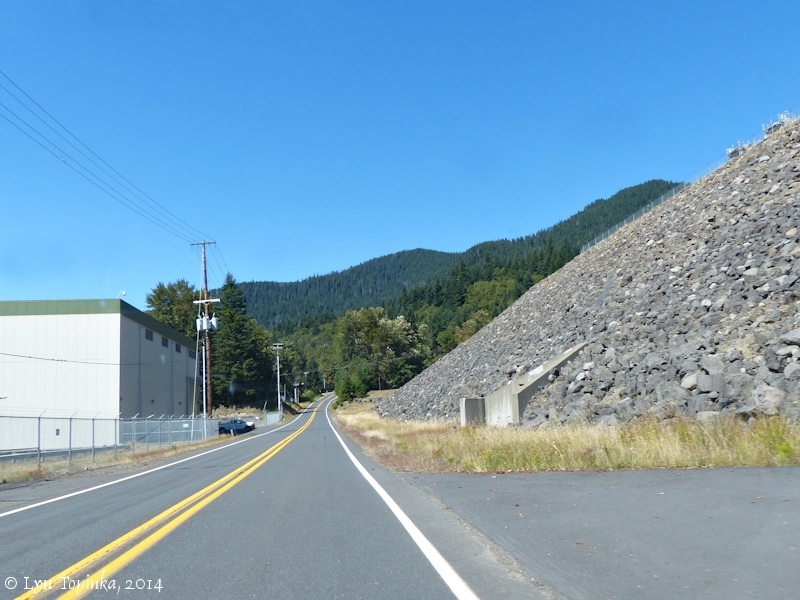 2 project owned by Cowlitz County PUD No. 1 before it is returned to the upper end of Yale Reservoir." 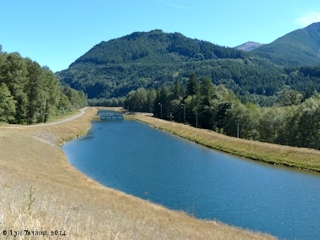 Click image to enlarge Swift Dam Power Canal, Washington, looking upstream. Image taken September 4, 2014. Click image to enlarge Washington Highway 503 at Swift Powerhouse No.2, Washington. Embankment on the right holds back the waters of the Swift Power Canal, connecting Swift No.1 with Swift No.2. View looking west. Image taken September 4, 2014. Swift Dam was built in 1958. It is a 512-foot high earthfill dam, making it one of the highest earthfilled dams in the world. 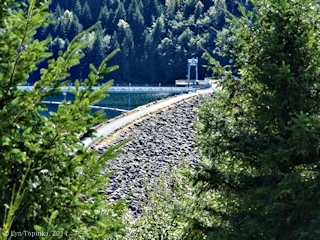 Click image to enlarge Swift Dam, Washington. Image taken September 4, 2014. 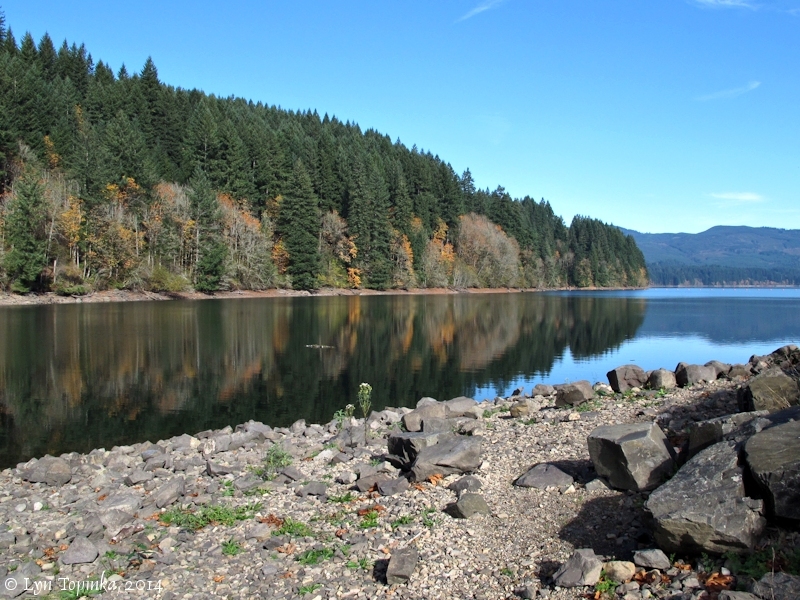 Swift Reservoir is the reservoir behind Swift Dam and is located on the North Fork Lewis River, 42 miles upstream from its confluence with the Columbia River. 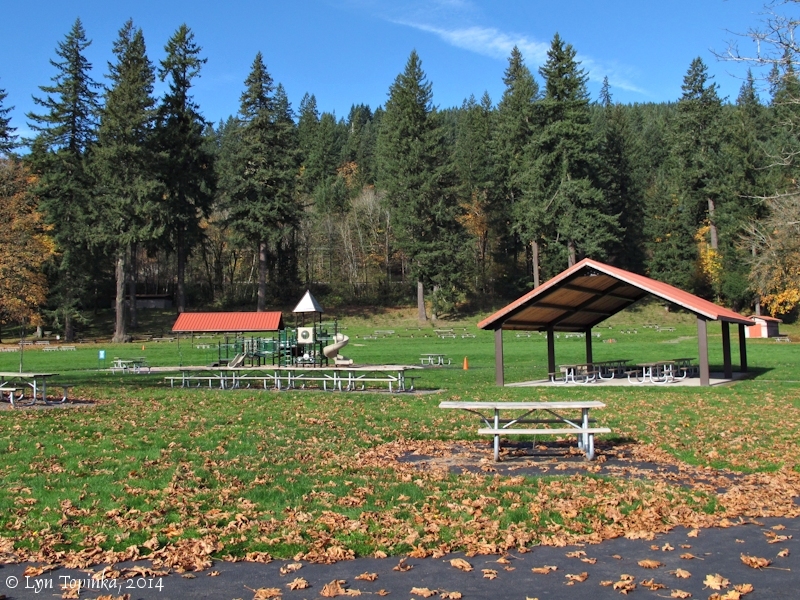 There are two recreational areas on Swift Reservoir (Swift Forest Camp and Eagle Cliff Park) with a combined 11 picnic tables, 93 campsites, and one boat launch (2011). 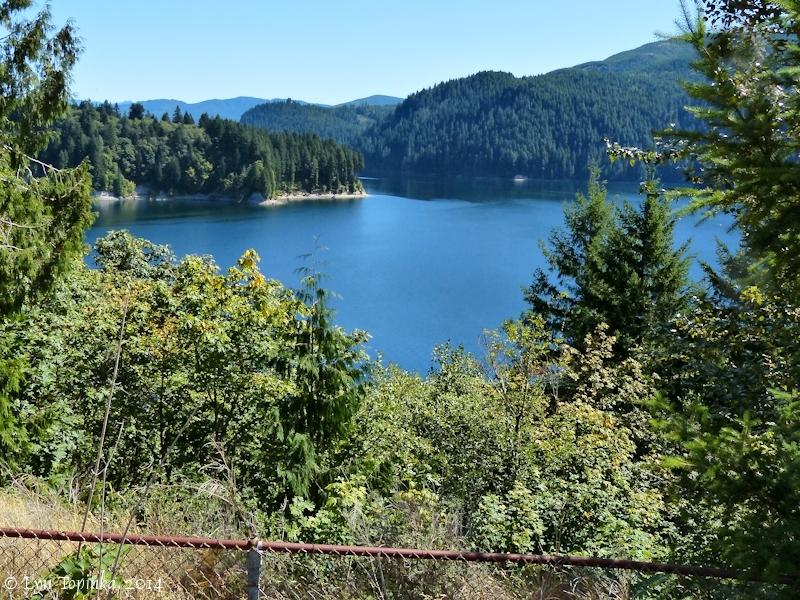 "Swift Reservoir: An artificial reservoir, 4,588.8 acres, maximum depth 380 ft., on the North Fork, Lewis River, 28-1/2 miles northeast of Woodland, west central Skamania County. It was named for Swift Creek which enters the river here, by Puget Sound Power & Light Company when that corporation created the reservoir." Click image to enlarge Swift Reservoir (Lewis River), Washington. Image taken October 17, 2018. 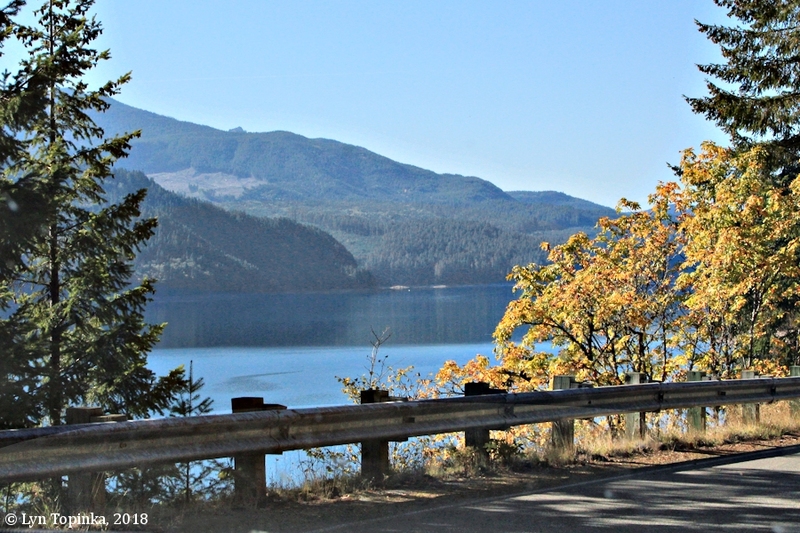 Click image to enlarge Swift Creek/Swift Reservoir, Washington. Bay pictured is backwater of the Swift Reservoir into Swift Creek. Image taken September 4, 2014. 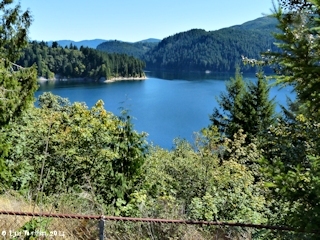 Click image to enlarge Swift Creek/Swift Reservoir, Washington. Bay pictured is backwater of the Swift Reservoir into Swift Creek. Image taken October 17, 2018. 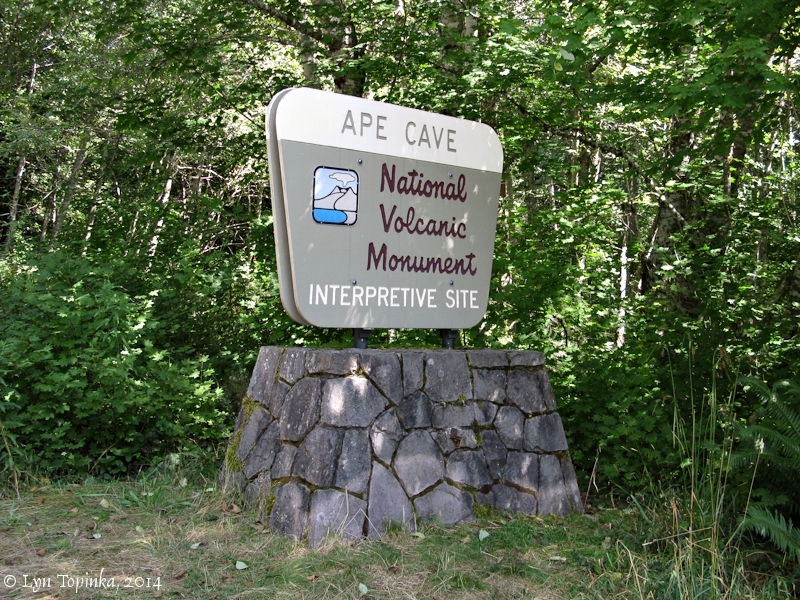 Ape Cave, at 13,042 feet long (nearly 2.5 miles), is the third longest lava tube in North America. It hosts a year-round temperature of 42°F. 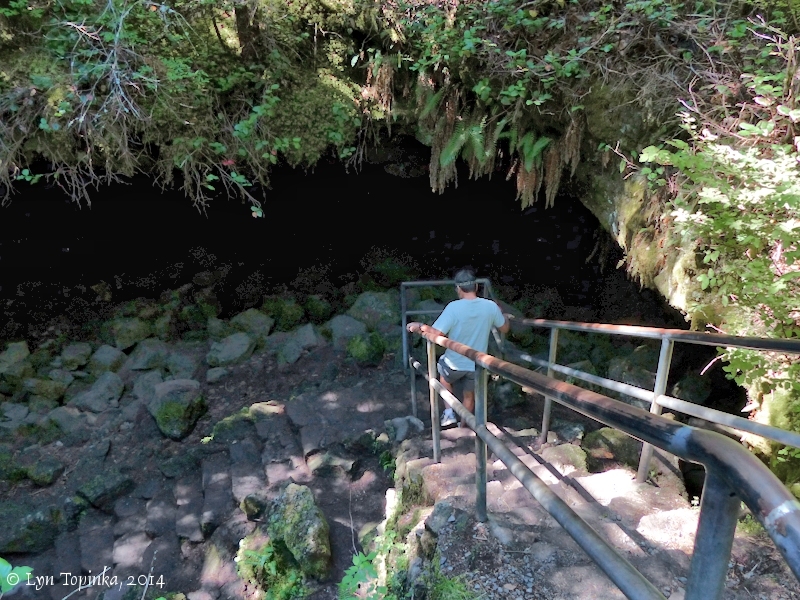 The lava tube was formed 1,900 years ago by an unusual basaltic eruption of Mount St. Helens volcano. 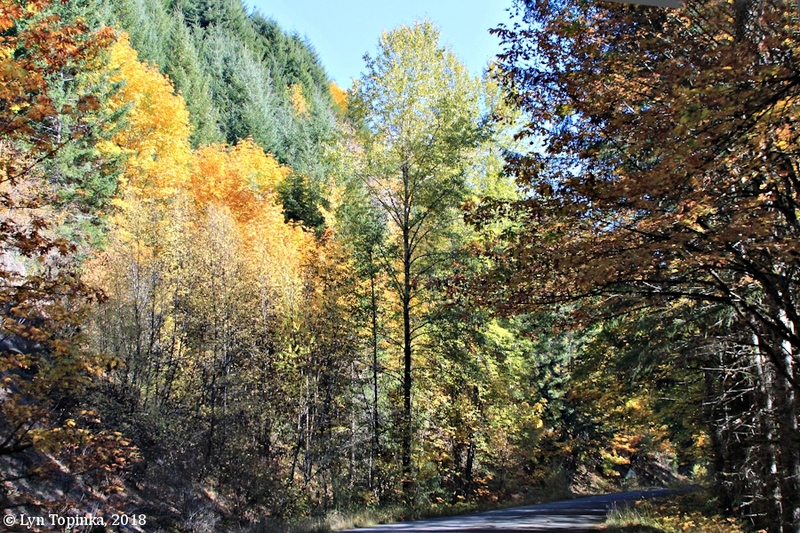 Ape Cave is located approximately six miles northeast of the small Washington community of Cougar. 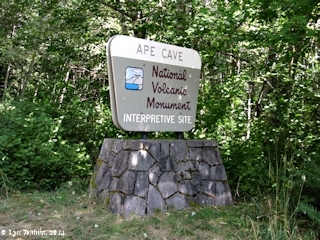 Click image to enlarge Sign, Ape Cave, Washington. Image taken September 4, 2014. 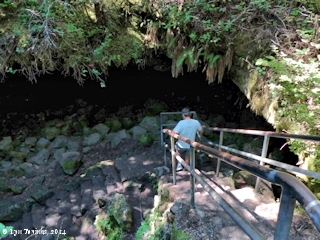 Click image to enlarge Stairs, Ape Cave, Washington. Image taken September 4, 2014. Swift Dam to the Eagle Cliffs, and beyond. 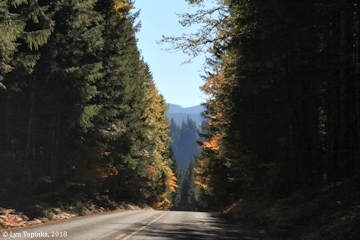 Forest Road 90 is a designated Federal Forest Highway and accesses residences along Swift Reservoir and beyond. 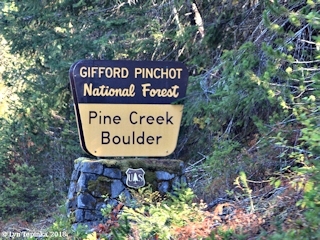 It is the main east-west artery in the center on the Gifford Pinchot. Important Forest sites along FR 90 include Pine Creek Information Center, Lewis River Falls, Twin Falls Campground, Ollalie and Takhlakh lakes and Mt. Adams Wilderness Area. FR 90 is plowed to Pine Creek in winter and is passable the rest of the way as snow melts in late spring and early summer. Source: U.S.D.A. Forest Service website, 2018. 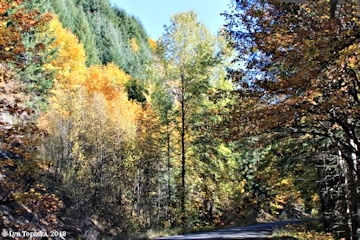 Click image to enlarge Scenic, NF-90, Swift Reservoir (Lewis River), Washington. Image taken October 17, 2018. Click image to enlarge Marble Creek drainage, looking south towards Swift Reservoir, Washington. Image taken October 17, 2018. 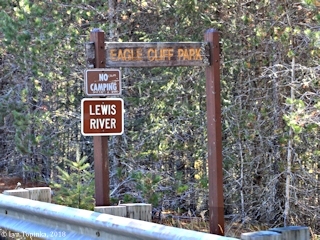 Click image to enlarge Sign, Lewis River at Eagle Cliffs, Eagle Cliff Park, Washington. Image taken October 17, 2018. 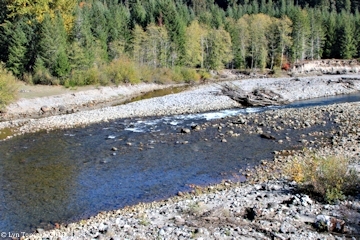 Click image to enlarge Lewis River at Eagle Cliffs, looking upstream, Washington. Image taken October 17, 2018. 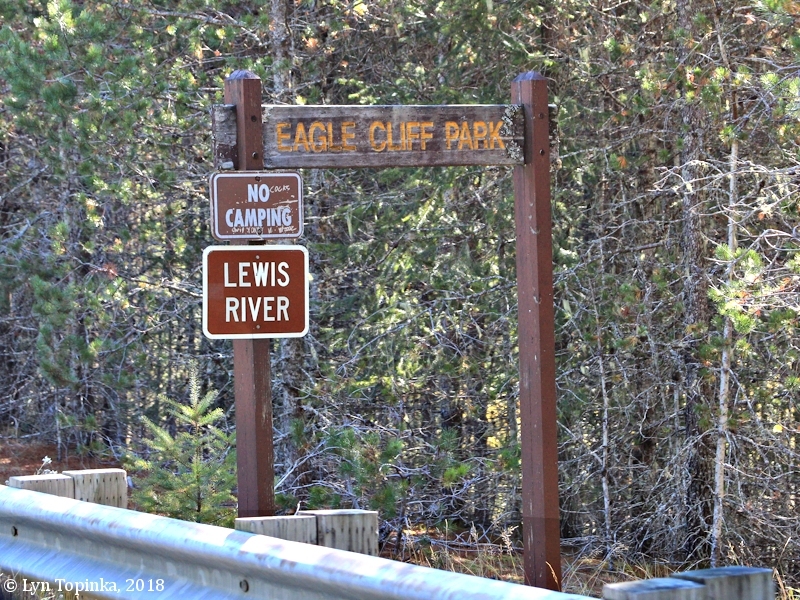 Click image to enlarge Lewis River Eagle Cliffs, Washington. Image taken October 17, 2018. 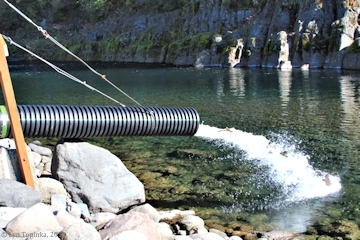 Click image to enlarge Coho dump, Lewis River at Eagle Cliffs, looking upstream, Washington. Image taken October 17, 2018. Click image to enlarge NF-90 Bridge, Lewis River at Eagle Cliffs, Washington. Image taken October 17, 2018. 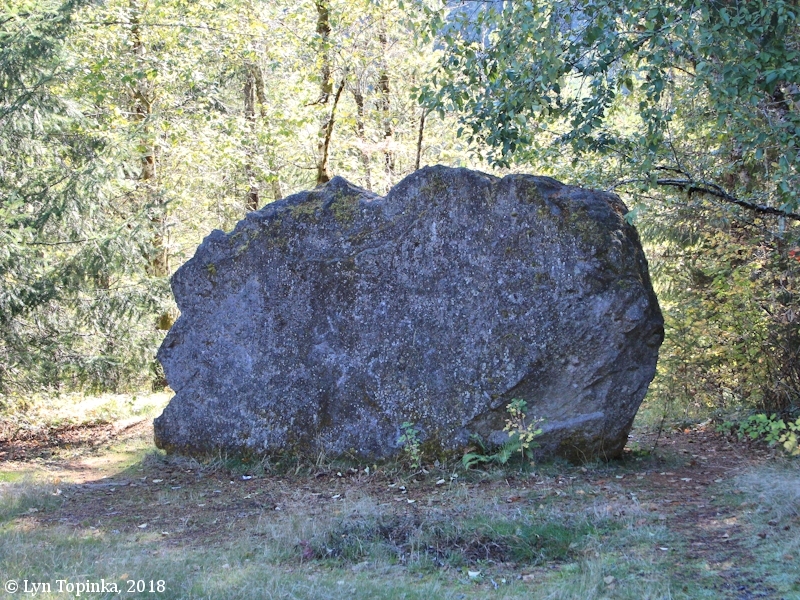 "PINE CREEK BOULDER: Adjacent to the small turnout on the west side of the Pine Creek bridge is a 37-ton boulder that was deposited in the old roadway 33 ft (10 m) above the creek by the May 18, 1980, lahar. This lahar was generated by the pyroclastic surge that descended the east slope of Mount St. Helens and swept across Muddy fan. Older material in the pit on the east side of the bridge and visible upstream in the northeast bank of Pine Creek is composed of pyroclastic-flow and lahar deposits of the Pine Creek eruptive period (3,000-2,500 yr B.P.). ..."
Source: Patrick T. Pringle, 1993, "Roadside Geology of Mount St. Helens National Volcanic Monument and Vicinity", Washington Department of Natural Resources, Division of Geology and Earth Resources Information Circular 88 (Revised Edition 2002). 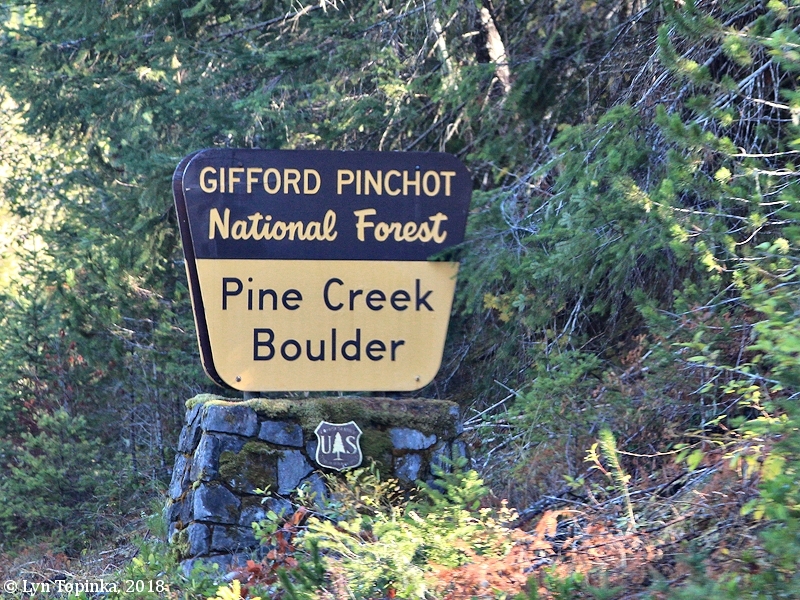 Click image to enlarge Sign, Pine Creek Boulder, Washington. Image taken October 17, 2018. 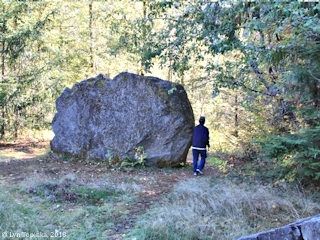 Click image to enlarge Pine Creek Boulder, Washington. Image taken October 17, 2018. Click image to enlarge Pine Creek looking upstream, Washington. Image taken October 17, 2018. Click image to enlarge Muddy River, looking downstream, Washington. From NF-25 Bridge, at Muddy River Mile (RM) 5.5. Image taken October 17, 2018. This morning we Set out verry early [from their campsite near Goble, Oregon] and at 9 A. M. arived at an old Indian Village on the N E side of Deer island [Deer Island] where we found our hunters had halted and left one man with the Canoes at their Camp, they arrived last evening at this place, and Six of them turned out very early to hunt, at 10 A. M. they all returned to camp haveing killed Seven Deer, those were all of the Common fallow Deer with a long tail [Columbian White-tailed Deer, currently being protected in the Julia Butler Hansen Refuge]. I measured the tail of one of these bucks which was upwards of 17 inches long; they are very poor, tho' they are better than the black tail Species of the Sea coast. those are two very distinct Species of Deer. the Indians call this large Island E-lal-lar, or Deer Island [Deer Island] which is a very appropriate name. the hunters informed us that they had Seen upwards of a hundred Deer this morning on this island. the interior of this Island is a prarie & ponds, with a heavy growth of Cotton wood, ash & willow near the river. we have Seen more water fowl on this island than we have previously Seen Since we left Fort Clatsop [Fort Clatsop, where the men wintered over], ... at ½ after 10 A. M. it became fair and we had the Canoes which wanted repareing hauled out and with the assistance of fires which we had kindled for the purpose dryed them Sufficiently to receve the pitch which was imedeately put on them; at 3 in the evening we had them Compleated and lanced and reloaded. we should have Set out but some of the party whome we had permitid to hunt Since we arrived heve not yet returned. we determined to remain here this evening [near the northern end of Deer Island] and dry our bedding &c. the weather being fair. Since we landed here we were visited by a large Canoe with ten nativs of the Quathlahpohtle nation who are numerous and reside about fourteen Miles above us on the N E. Side of the Columbia [today within the Ridgefield National Wildlife Refuge] above the Enterance of a Small river which the Indians call Châh-wâh-na-hi-ooks [Lewis River]. we saw a great number of Snakes on this island; ... The men who had been Sent after the deer returned with four only, the other 4 haveing been eaten entirely by the Voulturs except the Skin. The men we had been permitted to hunt this evening killed 3 deer 4 Eagles & a Duck. the deer are remarkably pore. Some rain in the after part of the day. we only made 5 miles to day—. we Set out very early this morning [from their camp on Deer Island] and proceeded to the head of deer island [Deer Island, Oregon] and took brackfast. the morning was very cold wind Sharp and keen off the rainge of Mountains to the East Covered with snow [Cascade Mountain Range]. the river is now riseing very fast and retards our progress very much as we are compelled to keep out at Some distance in the Curent to clear the bushes, and fallin trees and drift logs makeing out from the Shore. dureing the time we were at Brackfast a Canoe with three Indians of the Clan-nar-min-na-mon Nation came down, ... they reside on Wappato Inlet [Multnomah Channel] which is on the S W. side about 12 miles above our encampment of the last night [Deer Island] and is about 2 miles from the lower point, four other Tribes also reside on the inlet and Sluce which passes on the South W. Side of the Island [Sauvie Island], ... we proceeded on to the lower point of the Said island [Sauvie Island] accompanied by the 3 Indians, & were met by 2 canoes of nativs of the quath-lah-pah-tal who informed us that the chanel to the N E of the Island [Sauvie Island, the other channel being today's Multnomah Channel] was the proper one. 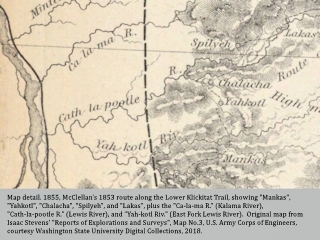 we prosued their advice and Crossed into the mouth of the Chah-wah-na-hi-ooks River [Lewis River] which is about 200 yards wide and a great portion of water into the columbia at this time it being high. The indians inform us that this river is crouded with rapids after Some distance up it. Several tribes of the Hul-lu-et-tell Nation reside on this river. at 3 oClock P. M. we arived at the Quath lah pah tle Village [Cathlapotle Village, today within the Ridgefield NWR, Carty Unit] of 14 Houses on main Shore to the N E. Side of a large island [Bachelor Island]. ... we purchased wappatoe and Some pashaquar roots. gave a Medal of the Small Size [Jefferson Peace Medal] to the principal Chief, and at 5 oClock reembarked and proceeded up [on Lake River] on the N E. of an Island [Bachelor Island] to an inlet [??? perhaps drainage from Carty Lake] about 1 mile [Lewis says 2 miles] above the village and encamped on a butifull grassy plac [Wapato Portage], where the nativs make a portage of their Canoes and Wappato roots to and from a large pond at a Short distance [Carty Lake]. in this pond [Carty Lake] the nativs inform us they Collect great quantities of pappato, which the womin collect by getting into the water, Sometimes to their necks holding by a Small canoe and with their feet loosen the wappato or bulb of the root from the bottom from the Fibers, and it imedeately rises to the top of the water, they Collect & throw them into the Canoe, those deep roots are the largest and best roots. Great numbers of the whistling Swan, Gees and Ducks in the Ponds. ... we made 15 miles to day only.